The Enigmatic Lunar Surface Feature Called "Ina"
If you wish to print this page, click HERE to open this page without frames in a new browser tab. Many of the linked 1/4 meter per pixel images are very large files which take a while to download. Some older 32-bit web browsers (notably Firefox) may not be able to display these very large linked images, in which case you will simply see a gray screen after clicking on the image thumbnail. If you see a gray screen after clicking on the thumbnail or link for any of these large images, then right-click on the image download link below the image thumbnail and save the linked image to your computer so that you can subsequently open the downloaded images with your computer's image processing program such as Photoshop, Gimp or another image processing program. Alternatively, you can use Google Chrome to view these large linked images since the 32-bit version of Chrome doesn't appear to have this display limitation for large image files. Current 64-bit versions of the current popular web browsers don't appear to have these image display limitations. This web page is a work in progress and was last revised on 2019-02-17. 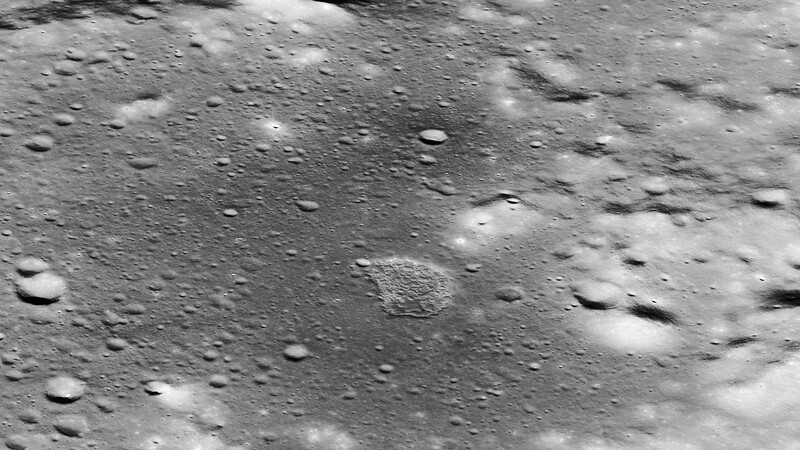 Ina is a lunar volcanic caldera which was first observed and photographed from orbit by the crew of the Apollo 15 mission in 1971. The Apollo 15 photographs were taken at low solar incidence angles (late morning sun) which resulted in low contrast. 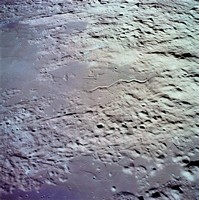 This limited the details which could be seen in the Apollo 15 Metric and Panorama Camera photographs. The Apollo 17 mission also observed and photographed Ina in 1972. The Apollo 17 photographs of Ina were taken at greater solar incidence angles (earlier morning sun). 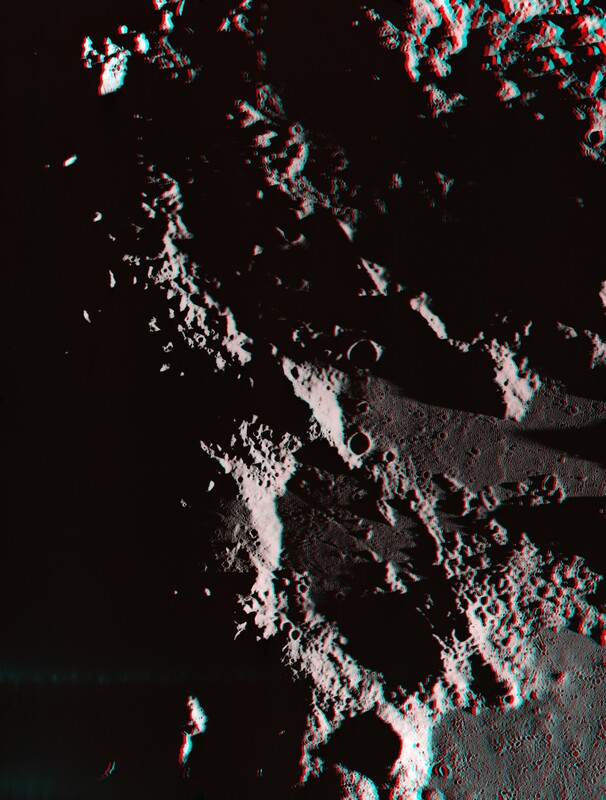 The greater solar incidence angles yielded higher contrast and finer details in the Apollo 17 Metric and Panorama Camera photographs. Ina is one of the most strikingly unique features seen on the lunar surface. 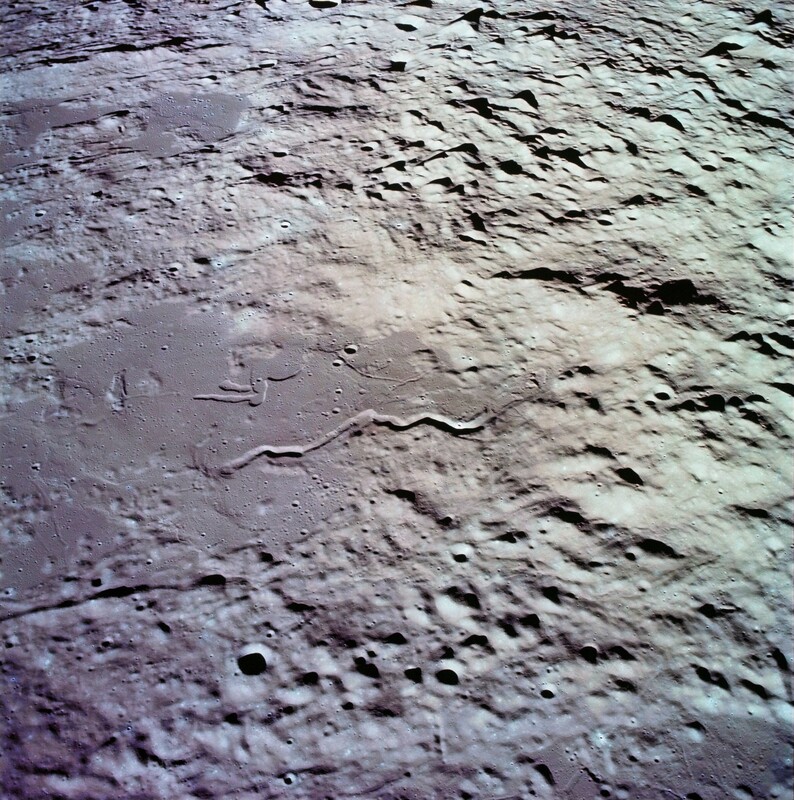 The photograph at the upper right is a composite of a LRO image and a color overlay derived from an Apollo 17 Hasselblad color photograph of Ina. (Click on the photo for a lovely full screen color view of Ina.) 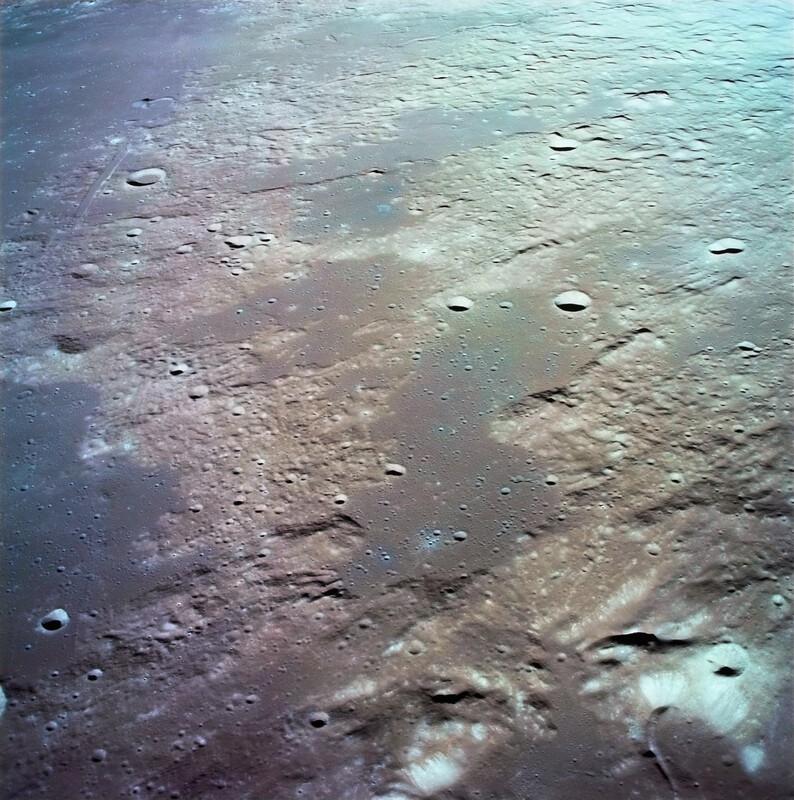 The caldera floor of Ina is covered with large areas of rocks and regolith which are rich in titanium basalts. The titanium basalts (ilmenite) give Ina's caldera floor a distinctly bluish hue. You will also note that areas near the edges of the mounds within the caldera also have a distinctly bluish hue. 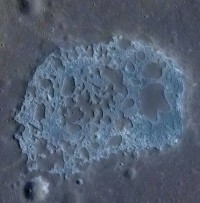 This blue "dusting" suggests that gaseous ejecta from the caldera floor covered portions of the mounds to give those portions a distinctly blue color. Ina's capital letter "D" shape, combined with Ina's bluish hue, makes Ina stand out literally like a sore thumbnail on the surface of the moon. The more one examines Ina, the more it becomes apparent that Ina is an extraordinarily complex lunar feature which obviously has a long geological history. More importantly, it also becomes obvious that Ina shows glaringly strong evidence of very recent geological activity  activity which appears to have occurred within the last 65 million years and perhaps may have occurred even more recently. For these and other reasons, Ina should be reclassified as a Tier 1 landing site for future unmanned or manned exploration. 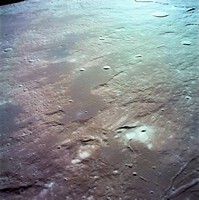 Ina is located in Lacus Felicitatis (Lake of Happiness) at 18.65° North and 5.3° East. 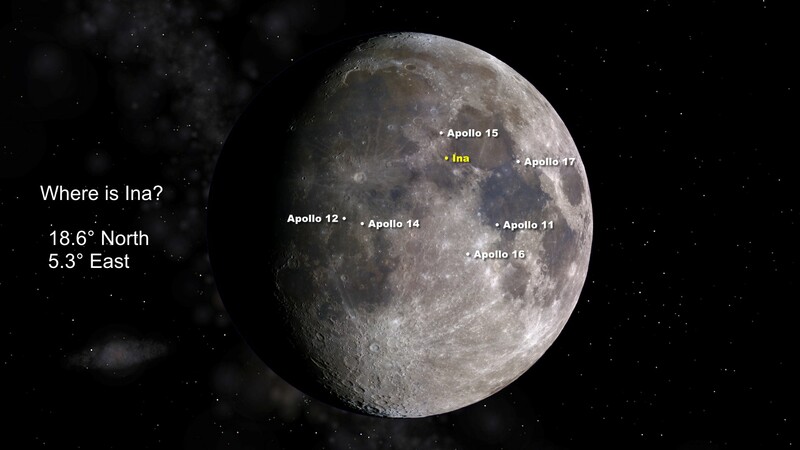 Ina is approximately 235 kilometers south-southeast of the Apollo 15 landing site. ACT React Quickmap View of Ina  View Ina using the LRO team's ACT React Quickmap software. 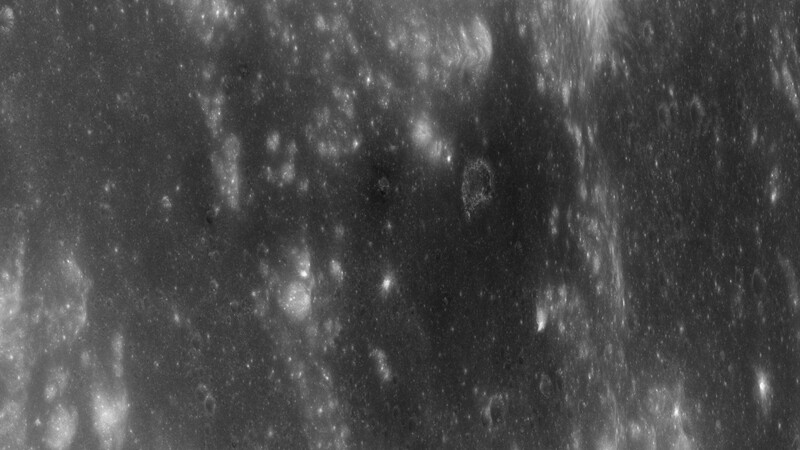 You can zoom in further and see LRO Narrow Angle Camera images of Ina, turn on and off various layers such as shaded relief maps and observational data from other missions, to name a few. Click on the wrench icon to see tools which will allow you to draw a box and search for all LRO images which cover the area within the box or to view a 3D DTM of the terrain within the box, or to draw one or more more line segments and then measure distances or generate an elevation plot along the line segments. These are some of the really neat things which you can do with Quickmap. My YouTube video, below, will give you a general overview of Ina's location and appearance. This video mainly is for the layman who has no idea what Ina is. 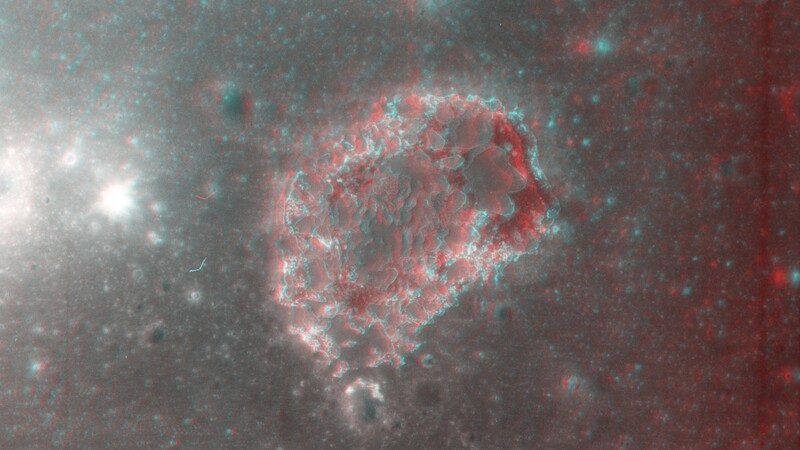 Have your red-cyan 3D glasses handy since several parts of this video feature 3D anaglyphs. This video is presented in HD 1080p. If you switch to YouTube's full screen mode, please be sure to click on the Settings (gear) icon and select 1080p for the best viewing experience. The last third of my video is a preview of Chapter 2 and quickly shows images which indicate how young some of Ina's surface features really are. Those images and others are presented further below. 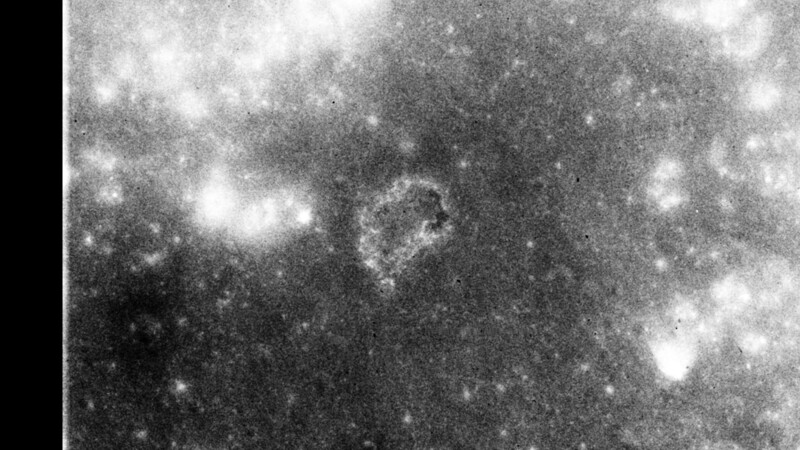 For nearly four decades it has been thought that Ina is a unique and enigmatic lunar feature which shows signs of recent volcanic activity. 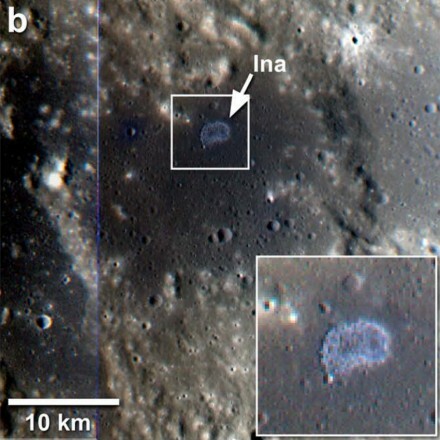 Prior to obtaining high resolution Lunar Reconnaissance Orbiter (LRO) images of Ina starting in August 2009, it had been postulated that Ina may have experienced volcanic events as recently as within the last 10 million years. The reasoning behind this statement is the fact that only a couple of craters were seen on Ina's mounds in the Apollo era Metric Camera and Panorama Camera photographs. Some recent research papers indicate that the last volcanic events within Ina may have occurred within the last 33 million years. I will present evidence that the last volcanic events may have been even more recent. 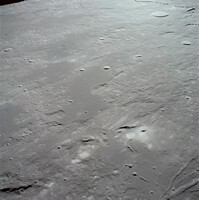 The prevailing Apollo era theories assumed that Ina's dark mounds, rather than the blue hue floor of the caldera, were created by subsequent magma upwellings. According to these theories, the mounds represent the most recent geologic activity seen within Ina's caldera. 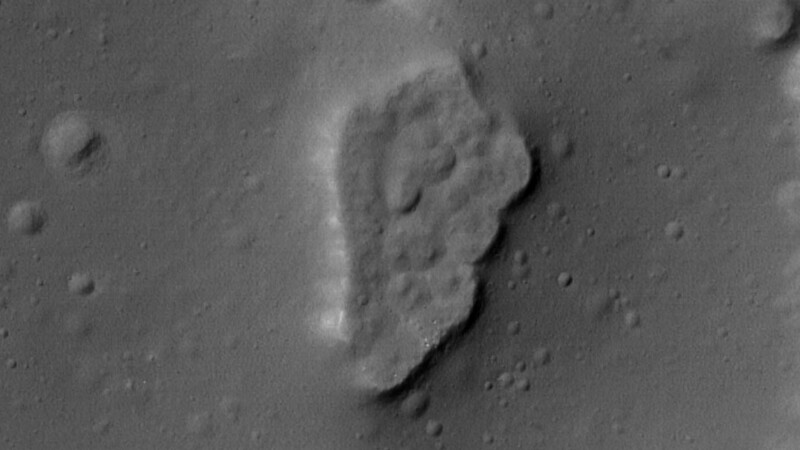 If Ina's mounds were older terrain, then significantly more cratering should have been visible in the Apollo era photographs of Ina's mounds. 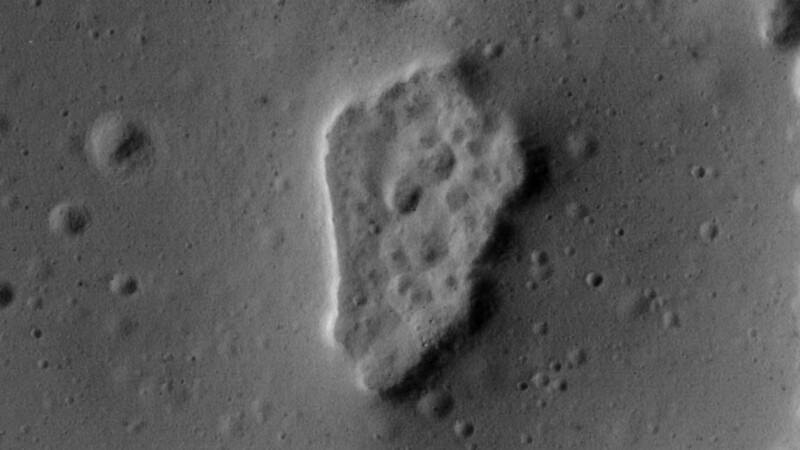 Since no significant cratering was visible on Ina's mounds (due to insufficient resolution and contrast within the Apollo era Metric and Panorama Camera images), it was assumed that not only were the mounds the most recently created features but also that these features must be very young. Following are links to research papers (PDF documents) which have been put forth to describe the nature, origin and age of Ina. These studies are quite fascinating to read. I have broken them down into three categories  Apollo Era, Clementine Era and LRO Era theories. 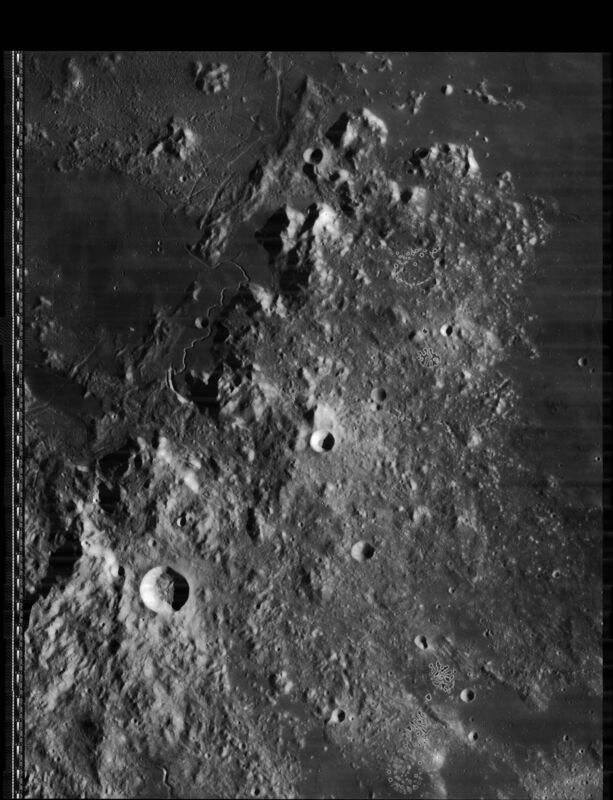 LRO Era theories must take into account the Apollo and Clementine images and data, and take into account what is seen in LRO images of Ina and perhaps similar irregular mare patches which the LRO has discovered on the moon. Apollo 15 Preliminary Science Report (just Ina) Ewen A. Whitaker 1972 Very brief. Notes shallow depth of only a few tens of meters and the apparent lack of craters as seen in the Apollo 15 Metric and Panorama Camera photographs. New geological findings in Apollo 15 lunar orbital photography (just Ina) Farouk El-Baz 1972 First theory to propose volcanic origin. Proposes that the blister-like domes appear to constitute the latest events. Suggests that the impact which formed the crater Osama dug up the bright materials seen along the north and east rim. 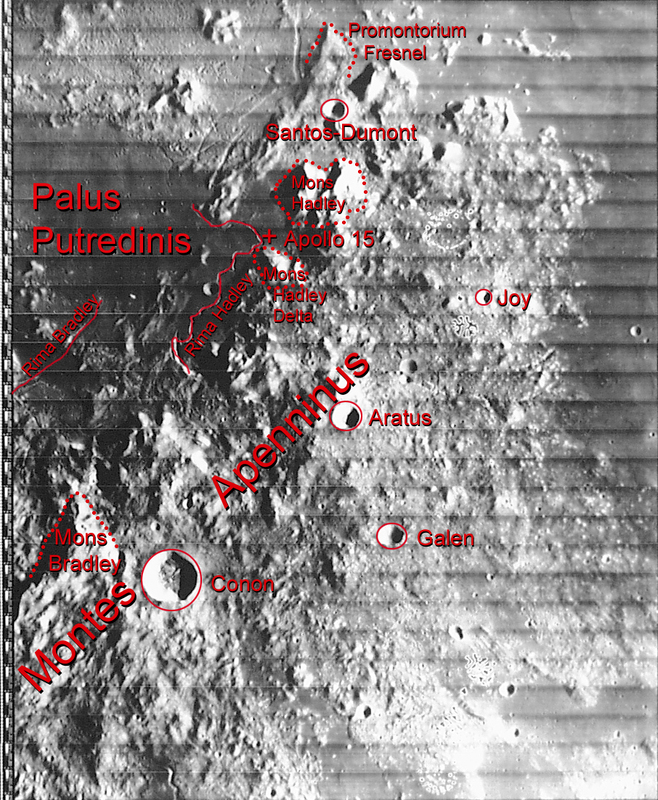 Apollo 17 Preliminary Science Report - "D-CALDERA" Farouk El-Baz 1973 Proposes scenarios of faulting and volcanism which created the Ina plateau, Ina's caldera, and Ina's mounds which are referred to as "domes." The Apollo 17 images associated with this report are shown further below. Geological Observations From Lunar Orbit R. E. Evans and Farouk El-Baz 1973 Noteworthy observations about Ina made by Apollo 15 Command Module Pilot Alfred M. Worden. Sulpicius Gallus is also mentioned. 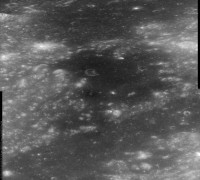 INA, A LUNAR CALDERA? P. L. Strain and Farouk El-Baz 1980 Initial version of the following document. THE GEOLOGY AND MORPHOLOGY OF INA P. L. Strain and Farouk El-Baz 1980 Describes two distinct morphological units within the caldera, Ina's mounds, and zones of brighter material. First theory to compare Ina to a terrestrial analog. Confirms that Ina is a volcanic caldera. Postulates that the Ina dome (plateau) is younger than the mares to the east and west. This report includes nice cross section elevation profiles of the Ina plateau and the caldera. RECENT LUNAR ACTIVITY: EVIDENCE AND IMPLICATIONS P. H. Schultz, M. Staid and C. M. Pieters 2000 First theory to propose that Ina still might be in the process of formation. Interprets the low lying fresh blocky material to be composed of titanium rich basalts which were exposed, possibly by sudden volcanic degassing, by the removal of either an overlying pyroclastic layer or overlying regolith. Recommends Ina for future lunar exploration. Lunar activity from recent gas release P. H. Schultz, M. Staid and C. M. Pieters 2006 Suggests that the age of the most recent features seen in Ina is only around 10 million years old. 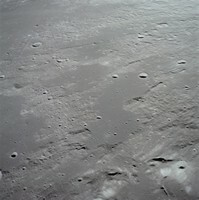 Notes that Ina is not a unique lunar surface feature and that there are at least four similar lunar endogenic features. Presents age data based on spectral wavelength and albedo from Clementine color ratios. HIGH RESOLUTION IMAGING OF INA: MORPHOLOGY, RELATIVE AGES, FORMATION M. S. Robinson, P. C. Thomas, S. E. Braden, S. J. Lawrence, W. B. Garry, and the LROC Team 2010 First theory, based on LRO images and crater counts, to suggest that Ina's mounds are not recent and that their age may be only somewhat younger than the surrounding mare on the Ina plateau. THE SPECTRAL PROPERTIES OF INA: NEW OBSERVATIONS FROM THE MOON MINERALOGY MAPPER M. Staid, P. Isaacson, N. Petro, J. Boardman, C. M. Pieters, J. W. Head, J. Sunshine, K. Donaldson Hanna, L. A. Taylor and the M3 Team 2011 Presents Kaguya and preliminary Chandrayaan-1 M3 observational data of Ina. 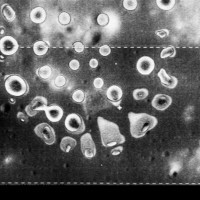 Compares the M3 spectral data to fresh craters in Mare Serenity and Mare Tranquility which exhibit weathering of around 1%. SCIENTIFIC CHARACTERIZATION OF LUNAR REGIONS OF INTEREST S.C. Mest, J.E. Bleacher, N.E. Petro, and R.A. Yingst 2011 Discusses analysis procedures for the 50 ROI's of NASAs Constellation Program Office (CxPO). Initial evaluation of 5 ROI's is discussed. Each ROI is to be evaluated by constructing hypothetical traverses within the area defined by the CxPO up to distances of 5, 10 and 20 km from the ROI location, and then estimating the scientific return using the results from mapping potential exploration routes. Ina is classified as Tier 2 instead of Tier 1. 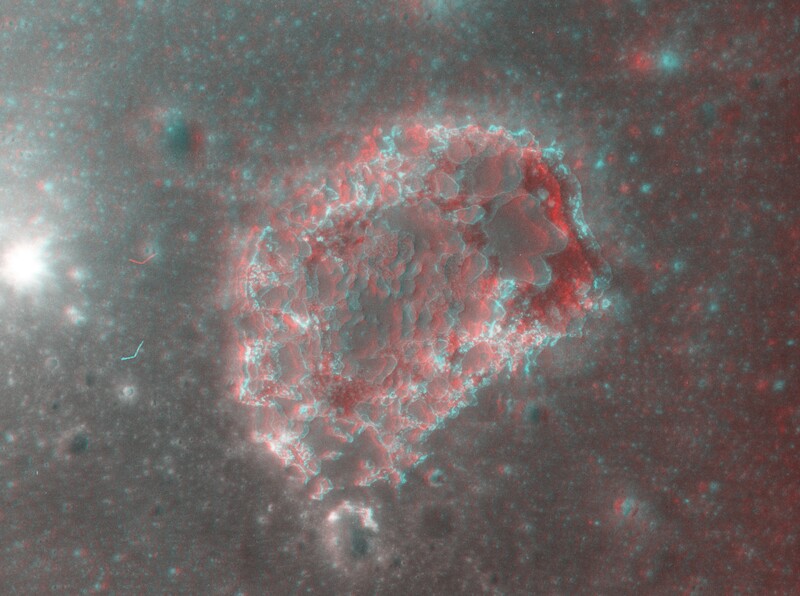 LAVA FLOW INFLATION FEATURES ON THE MOON? : A COMPARISON OF INA WITH TERRESTRIAL ANALOGS W. B. Garry, J. R. Zimbelman, J. E. Bleacher, S. E. Braden, L. S. Crumpler, and the LROC Team 2011 Another theory which compares Ina's mounds to terrestrial analogs. Theory proposes that Ina's mounds were fed by horizontal flow of lava, possibly by drain-back of lava into the caldera. The origin of Ina: Evidence for inflated lava flows on the Moon W. B. Garry, M. S. Robinson, J. R. Zimbelman, J. E. Bleacher, B. R. Hawke, L. S. Crumpler, S. E. Braden, and H. Sato 2012 A subsequent publication by Garry which specifically discusses the possible origins of Ina's features and compares Ina's features to a terrestrial analog. LUNAR MENISCUS HOLLOWS P. J. Stooke 2012 Paper provides locations of over two dozen examples of lunar meniscus hollows. Thumbnail images are shown for 20 of these examples. This paper is a "heads up" about these other examples on the moon which have features similar to Ina, and this paper implies that the most recent volcanic events on the moon may be more recent than was previously thought. REGOLITH CHARACTERIZATION USING LROC NAC DIGITAL ELEVATION MODELS OF SMALL LUNAR CRATERS J. D. Stopar, M. S. Robinson, E. J. Speyerer, K. Burns, H. Gengl, and the LROC Team 2012 Discusses using LROC DEMs and the morphology of small craters to characterize the nature of the lunar regolith. Preliminary results suggest that circularity may be a non-unique criterion for distinguishing between primary and secondary craters. TiO2, FeO, and texture analysis map of Lunar crater Ina, based on SELENE Multi-band Imager data A. Yamamoto, R. Furuta, M. Ohtake, J. Haruyama, T. Matsunaga and H. Otake 2013 Kaguya (SELENE) Multiband-Imager data is used to calculate titanium and iron abundance within and around Ina. Notably, Figures 1 and 2 in this paper not only suggest that the most recent eruptions occurred mostly within the eastern portion of the caldera, but also hint that Ina long ago may have had a much larger caldera. 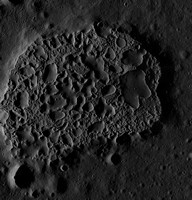 RADAR OBSERVATIONS OF LUNAR HOLLOW TERRAIN Lynn M. Carter, B. Ray Hawke, W. B. Garry, Bruce A. Campbell, T. A. Giguere, and D. B. J. Bussey 2013 Radar observations of lunar volcanic features have shown that some surfaces, including some of the hollows, are surrounded by fine-grained, block-free material that is consistent with pyroclastics. 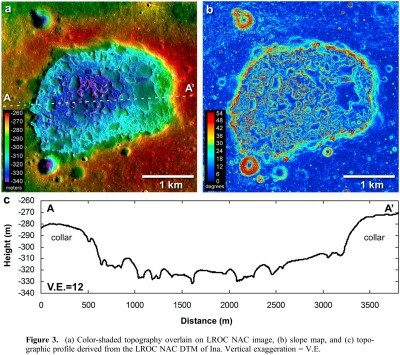 AGE AND EXTENT OF SMALL, YOUNG VOLCANIC ACTIVITY ON THE MOON S. E. Braden, M. S. Robinson, J. D. Stopar, C. H. van der Bogert, B. R. Hawke 2013 Notes the widespread occurrence of newly discovered small Ina-style volcanic features with similar morphologies. Describes feature similarities and ages based on crater counts. Suggests that there is a difference, based on the overlap of crater size frequency distributions, in the target properties of the smooth and rough features seen at these Ina-style locations. UPDATE ON THE SCIENTIFIC CHARACTERIZATION OF LUNAR REGIONS OF INTEREST S.C. Mest, A. Calzada-Diaz, J.E. Bleacher, N.E. Petro, and R.A. Yingst 2013 Ina remains classified as a Tier 2 site even though I consider Ina to be a Tier 1 landing site for either unmanned rovers or for human exploration. OPTICAL MATURITY (OMAT) OF INA 'D-CALDERA', THE MOON W. B. Garry, B. R. Hawke, S. Crites, T. Giguere, and P. G. Lucey 2013 Optical maturity and reflectance maps of Ina, based on Kaguya (SELENE) Multiband Imager data, are presented. Note the variation in the optical maturity of Ina's largest mound, Agnes, and the large mound above Agnes towards their edges. Note the Figure 4 image in this research paper with regards to my section much further below which is titled "Albedo and Heiligenschein as Indicators of Ina's Age". INA_LIKE YOUNG VOLCANIC(?) STRUCTURES AS GOLDEN SPIKE SITES. 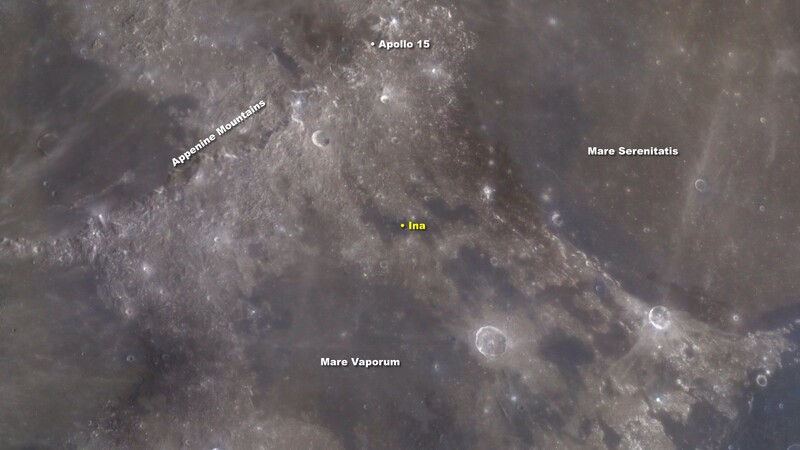 P. J. Stooke 2013 Discusses identified sites which would be ideal landing sites in order to investigate what are now known as Irregular Mare Patches (IMPs) which represent the last gasps of lunar volcanism. Analysis of Spacecraft Data for the Study of Diverse Lunar Volcanism and Regolith Maturation Rates Sarah E. Braden 2013 A dissertation by Sarah Braden about lunar volcanism. Provides a lot of useful background information about the LRO's optical instruments and the in-flight radiometric calibration of the LRO optical instruments. 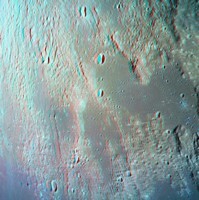 Compares the optical maturation rates of Mercury and the moon. Discusses silicic non-mare volcanism (Gruithuisen domes), irregular mare patches, Copernican volcanism and regolith maturation rates. Active moon: evidences from Chandrayaan-1 and the proposed Indian missions Narendra Bhandari and Neeraj Srivastava 2014 Not specifically about Ina, but does mention Ina. This research article suggests sources for magma with high titanium content. Discusses the early evolution of the moon and recent volcanism. LUNAR INA-LIKE FEATURES: MAPS AND MORPHOMETRY N. W. Chan, W. M. Vaughan, and J. W. Head 2014 Hypothesizes that Ina formed (and is forming) by ongoing ground collapse into a porous subsurface, perhaps into large aggregated vesicles or voids in a ~1 Gya lava flow unit. CHARACTERIZING LOCATIONS FOR FUTURE LUNAR EXPLORATION USING RECENT MISSION RESULTS S. J. Lawrence, J. D. Stopar, E. J. Speyerer, M. S. Robinson, B. L. Jolliff 2014 Discusses procedures for identifying optimal landing sites, meter-scale rover traverses, and operational concepts for rover, lander, and/or human exploration. Presents information about accessibility, navigability and hazard analysis for different terrains. 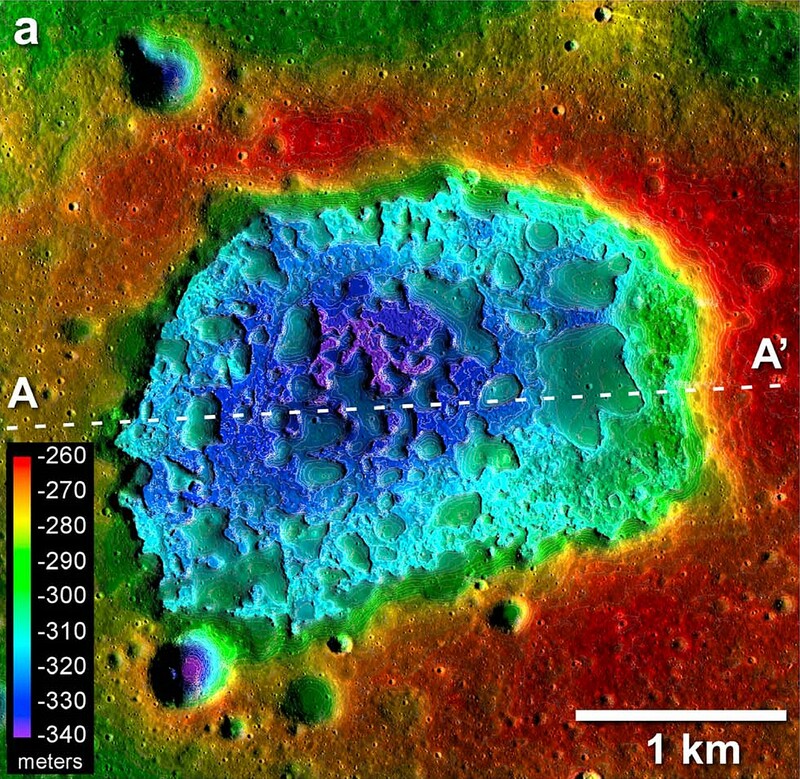 Evidences of relatively new volcanic flows on the Moon R. P. Gupta, N. Srivastava and R. K. Tiwari 2014 Not specifically about Ina, but presents evidence that the lava flows seen at Lowell crater were created relatively recently and are of volcanic origin instead of being impact related. Supplementary Information S. E. Braden, J. D. Stopar, M. S. Robinson, S. J. Lawrence, C. H. van der Bogert and H. Hiesinger 2014 A great deal of evidence is presented which indicates that the moon has experienced many events of volcanism within the last 100 Ma and possibly a lot more recently at some locations. The supplementary information document shows photographs and lists the locations of 70 irregular mare patches (IMPs). 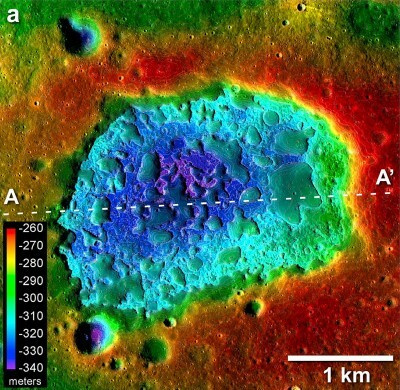 A LANDSCAPE EVOLUTION PERSPECTIVE ON HOW YOUNG IS YOUNG ON THE LUNAR SURFACE C. I. Fassett and B. J. Thomson 2015 Presents a diffusion model in order to estimate the age of irregular mare patches. This model appears to be very promising. 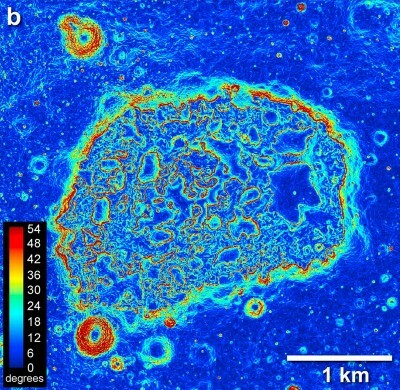 MOON MINERALOGY MAPPER INVESTIGATION OF THE INA IRREGULAR MARE PATCH K. A. Bennett, B. H. N. Horgan, J. F. Bell III, H. M. Meyer, and M. S. Robinson 2015 Proposes that the smooth deposits and the uneven surfaces within the Ina caldera could have been contemporaneously created such that the uneven surface formed as a result of blocky breakouts from the inflated lava flows. 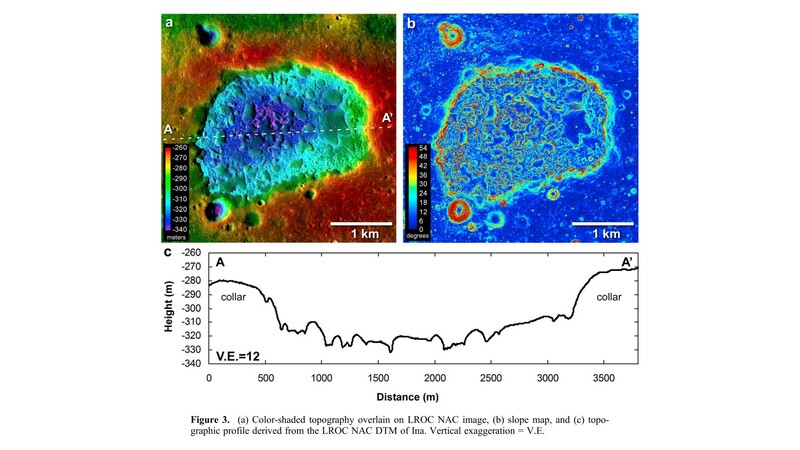 REGOLITH FORMATION ON YOUNG LUNAR VOLCANIC FEATURES C. M. Elder, P. O. Hayne, R. R. Ghent, J. L. Bandfield, J.-P. Williams, and D. A. Paige 2016 Presents preliminary observations from the LRO Diviner thermal radiometer of the four largest IMPs: Sosigenes, Ina, Cauchy-5, and Maskelyne. Investigates how the Diviner derived rock abundance and regolith properties of the IMPs constrain their formation and evolution. ERUPTION OF MAGMATIC FOAMS AND UNUSUAL REGOLITH PROPERTIES: ANOMALOUSLY YOUNG CRATER RETENTION AGES AND THE CASE OF INA J. W. Head, L. Wilson, L. Qiao, L. Xiao 2016 This abstract specifically discusses Ina with regards to the production of CO and water vapor gasses during a magma eruption, the closure of the magma dikes due to the response of the moon's crust, and the resulting formation of magma foam both under the surface and on the surface of the Ina caldera. This theory about the stages of magma eruptions which involve CO and water vapor gasses, and what one would expect to see in terms of the resulting terrain, is the only theory which accounts for what is seen in the LRO images of Ina which I present much further below. 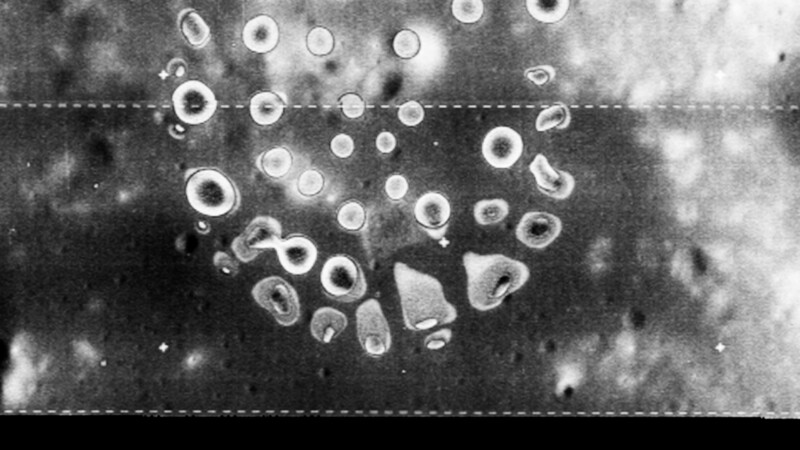 INVESTIGATING YOUNG (<100 MILLION YEARS) IRREGULAR MARE PATCHES ON THE MOON USING MOON MINERALOGY MAPPER OBSERVATIONS. J. Grice, K. L. Donaldson Hanna, N. E. Bowles, P. H. Schultz, K. A. Bennett 2016 Discusses the optical immaturity seen in the Chandrayaan-1 M3 spectrometer results in the VNIR spectrum for Ina and the Sosigenes IMPs which are the two largest IMPs. INVESTIGATING YOUNG (<100 MILLION YEARS) IRREGULAR MARE PATCHES ON THE MOON USING DIVINER OBSERVATIONS. K. L. Donaldson Hanna, R. Evans, N. E. Bowles, P. H. Schultz, B. T. Greenhagen, K. A. Bennett 2016 A similar discussion as the above paper, yet based on LRO Diviner observations. A COMPREHENSIVE GEOLOGICAL CHARACTERIZATION OF THE INA VOLCANO SUMMIT PIT CRATER ON THE MOON: EXTRUSIONS OF WANING-STAGE LAVA LAKE MAGMATIC FOAMS PRODUCES ANOMALOUSLY YOUNG CRATER RETENTION AGE. L. Qiao, J. W. Head, Z. Ling, L. Wilson, L. Xiao, J. Dufek 2018 Interprets Ina's mounds to be magmatic foam eruptions through cracks in the solidified lava lake crust. THE IRREGULAR MARE PATCH EXPLORATION LANDER (IMPEL) SMALLSAT MISSION CONCEPT. D. S. Draper, J. D. Stopar, S. J. Lawrence, B. Denevi, K. John, L. Graham, J. Hamilton, Z. Fletcher, J. Gruener, S. Bertsch 2018 This is a really neat paper about using smallsat landers to photograph the terrain and to examine the morphology of Ina. CHARACTERIZATION OF A POTENTIAL COMPOSITIONAL HALO AROUND INA IRREGULAR MARE PATCH. L.M. Glaspie, K.A. Bennett, L.R. Gaddis, K.L. Donaldson Hanna, B.H.N. 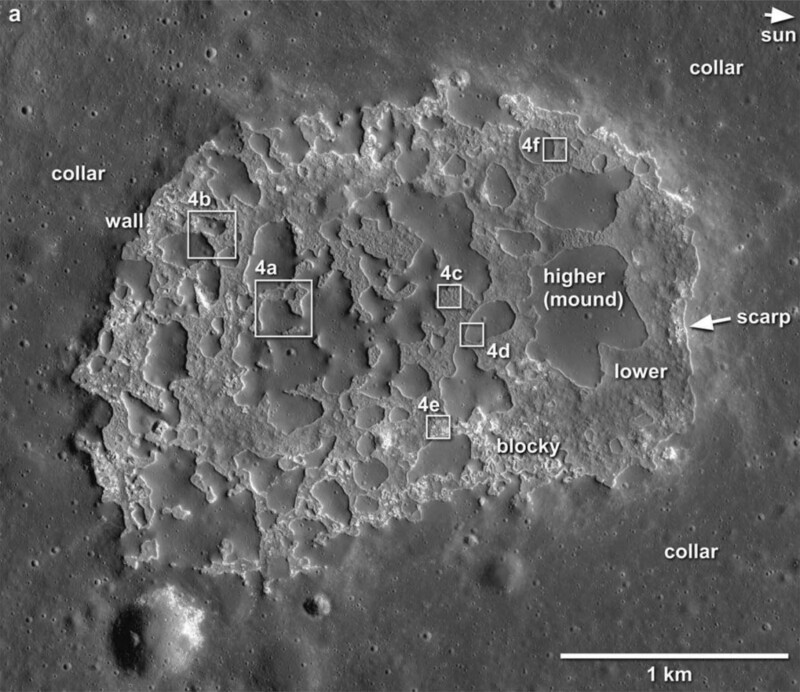 Horgan, L. Keszthelyi, J. Stopar, S. Lawrence 2019 Discusses the Chandrayaan-1 M3 spectrometer results which appear to show a compositional halo around the Ina caldera. Two processeses for the creation of the halo are proposed. Personally, I think that both proposed processes are involved since portions of the lower units of foamy lava appear to have either two ot three distinct ages. 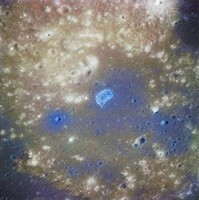 Enhanced Lunar Orbiter image credit NASA/LIORP/LPI/GoneToPlaid. 4102 H3 Enhanced Close-Up of Ina As far as I am aware, Lunar Orbiter photograph 4102 H3 is the only Lunar Orbiter photograph which shows Ina. It was taken by Lunar Orbiter IV. Ina is at the bottom and towards the right. Unfortunately Ina is partially obscured by onboard film processing defects in this Lunar Orbiter IV photograph. This might explain why the Ina caldera was never spotted for what it plainly is  a volcanic caldera. A remarkable amount of detail is seen within Ina within my enhanced 4X magnification close-up of 4102 H3 which I created from the LOIRP TIFF image file. Yet, literally, take any fine details which you see with a grain of salt since it wasn't until nearly 20 years later that Agfa, Fuji and Kodak finally mastered the nuances of controlling film grain to create the new high speed fine grain films which became very popular in the 1980's. 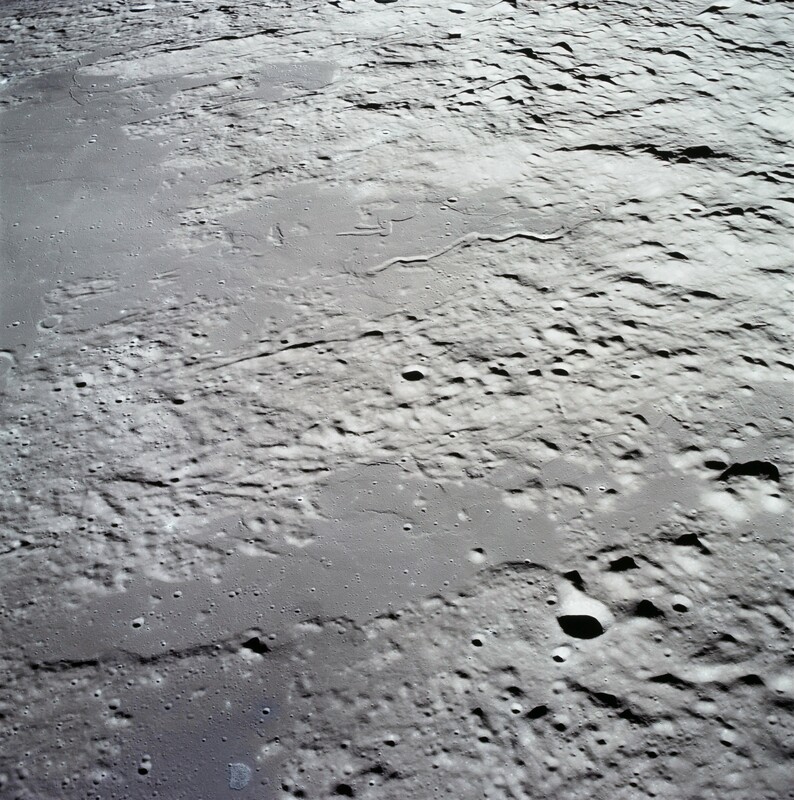 The Apennine Mountains, Hadley Delta, Hadley Mons and the Apollo 15 landing site are also visible in this Lunar Orbiter photograph. See the Lunar and Planetary Institute's labeled version of this Lunar Orbiter photograph. The Consolidated Lunar Atlas does not clearly show Ina either. 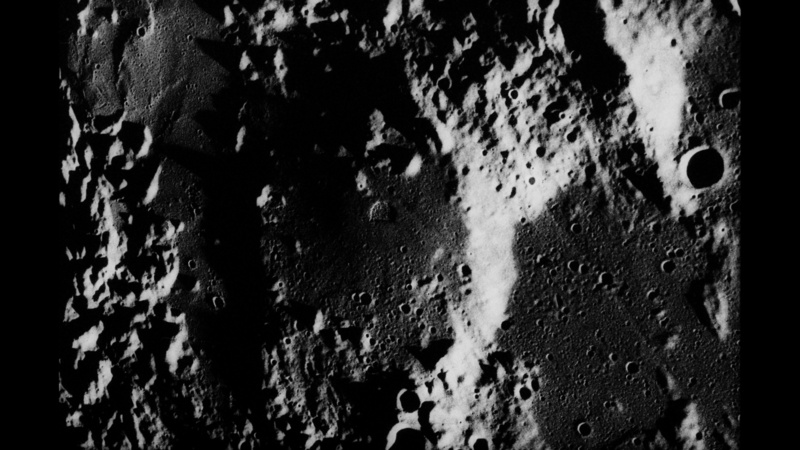 Ina is visible in the Consolidated Lunar Atlas, but with nowhere enough detail for anyone to recognize Ina as a volcanic caldera. 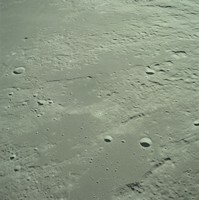 Since Ina was discovered during the Apollo 15 mission, it is appropriate to show all of the Apollo mission photographs of Ina since several research papers were published about Ina during the nearly 40 years before the Lunar Reconnaissance Orbiter took the first really good high resolution photographs of Ina. Apollo Panorama Camera photos are credit NASA/JSC/Arizona State University. Apollo Metric Camera photos are credit NASA/JSC/Arizona State University. 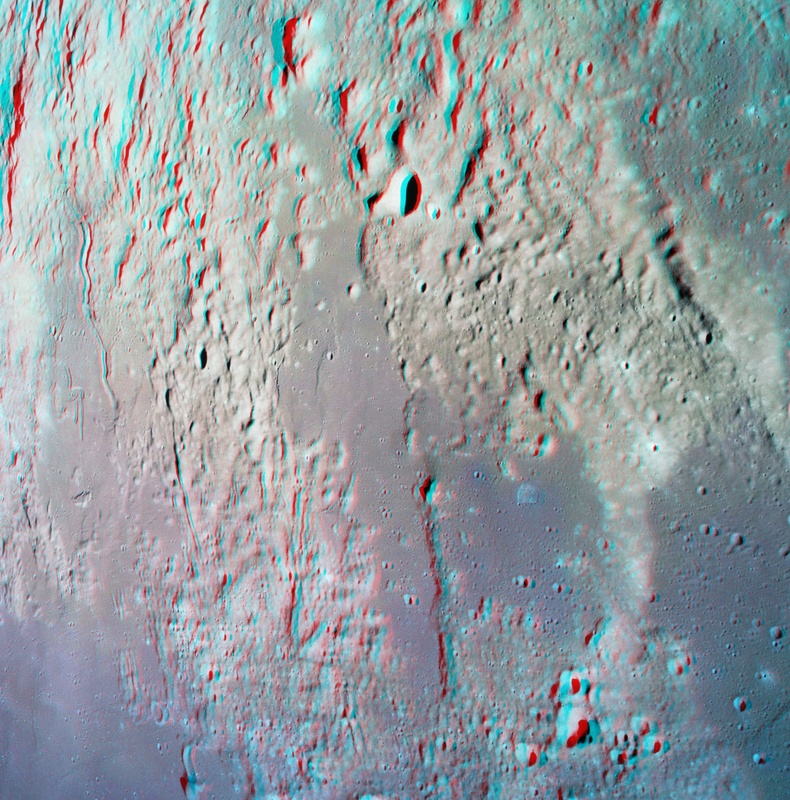 Apollo Metric Camera 3D anaglyphs are credit NASA/JSC/ASU/GoneToPlaid. All of the following raw scans of the Apollo 17 flight films have unnaturally low contrast and have a strong greenish cast. This was undoubtedly caused by CSM cabin fluorescent lighting reflections off of the CSM window when these photographs were taken. Lens vignetting correction has not been calculated or applied. Doing so would result in better color balance towards the edges and corners of the image frames, but light transmission curves for various visual wavelengths do not exist. Raw scans are credit NASA/ISD. Color balanced and enhanced Hasselblad images are credit NASA/ISD/GoneToPlaid. The following photographs are more than just "pretty pictures" which were taken by Apollo 17 Command Module Pilot Ronald E. Evans. In particular, researchers and the layman alike will be impressed by what is seen in the enhanced photos shown in the rightmost column for each photograph. These colors, although strongly enhanced and although the hues might be a bit off, are real and show that the moon has an extraordinarily dynamic history of events. Some of these events can affect the surface terrain hundreds if not thousands of miles away from the location of these specific individual events. 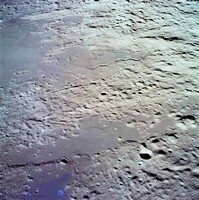 You will see, for example, that the mares tend to be blue which indicates high titanium content, that there are wisps of blue titanium laden material which has covered some mare regions almost as if they were deposited by gaseous winds from volcanic events elsewhere on the moon, and that some craters versus other craters are extremely blue. What is interesting are the blue craters. The blue color cast would seem to suggest that the excavated craters were subsequently overlaid with blue colored titanium rich material. The orange colored terrain at Sulpicius Gallus is also seen in the enhanced photo for AS17-153-23572. You might also notice regions which, even though the terrain is similar, have a distinctly different hue for no apparent reason. This hued terrain suggests that the moon's present surface is indeed composed of an amalgamation of various types of materials, some of which must be from large meteorite impacts or from the original accretion of the moon, and some of which are the result of subsequent geological events such as lunar volcanism. You might also notice that the hue of the same portion of terrain changes somewhat from one photograph to the next. This is because the the emission angle of the reflected sunlight is different for each photograph. This, combined with the moon's Heiligenschein effect, results in eery shifts in the hues of the terrain from one photograph to the next. The entire region seen along the East to West flight path of Apollo 17's flyover of Ina is indeed a remarkably interesting area on the moon. 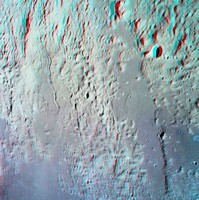 The following are "special" 3D anaglyphs. The extreme difference in perspective between the left and right stereo image pairs would yield 3D anaglyphs which are extremely difficult to view since the human brain just can't handle the extreme differences in perspective between the left and right eye images. 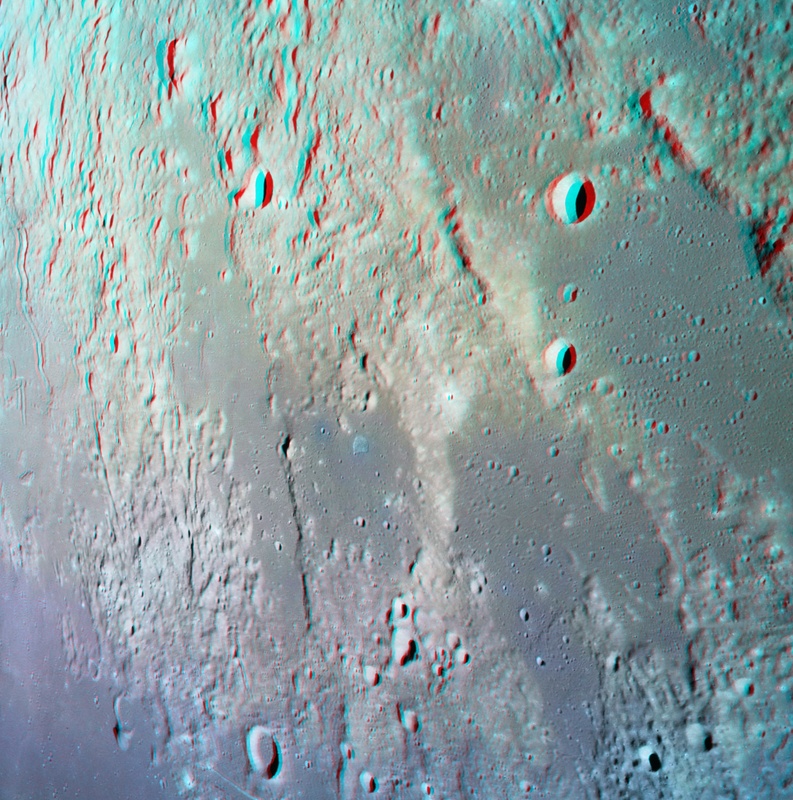 To compensate for this extreme difference in perspective, the widths of the right eye images were adjusted to simulate a much smaller difference in perspective relative to the left eye images so that the resulting 3D anaglyphs are compatible for viewing with conventional red-cyan viewing glasses and without having to use special optical equipment. 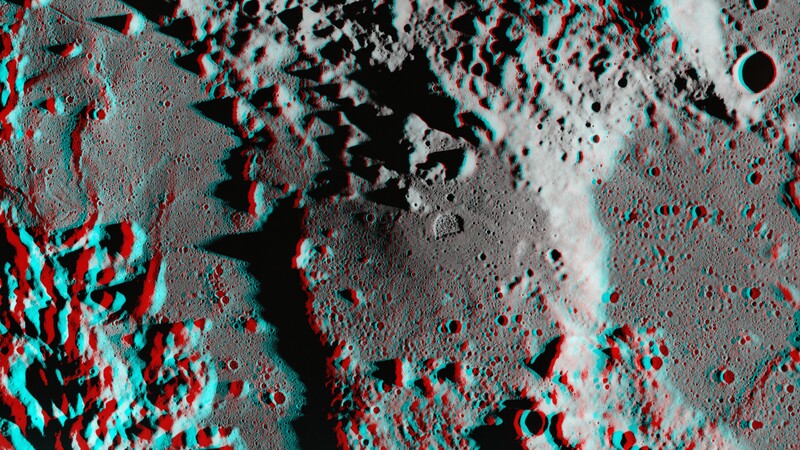 The result is something in between a true perspective view and an isometric view of the lunar terrain. 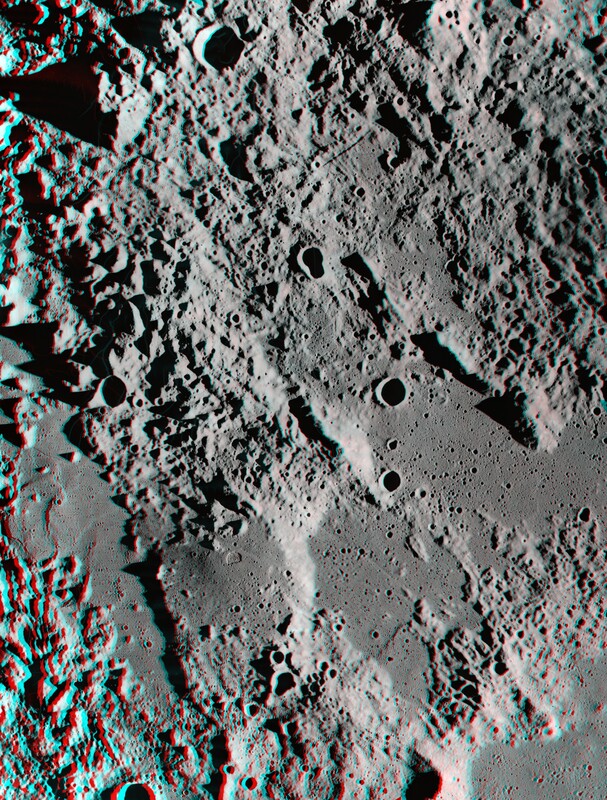 The following Hasselblad 3D anaglyphs are credit NASA/ISD/GoneToPlaid. 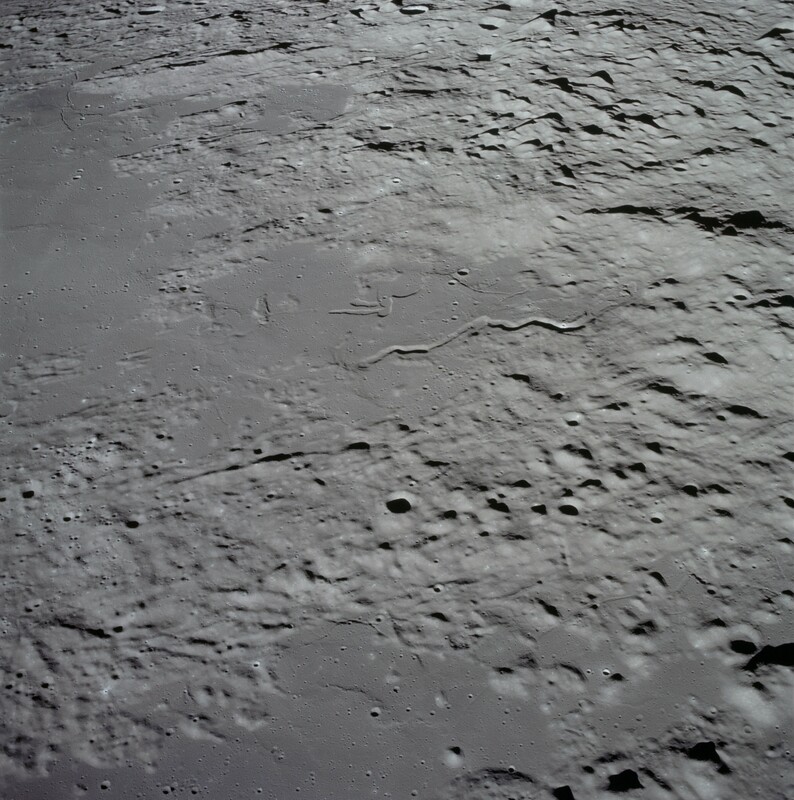 Original 35mm images are credit NASA/JSC/ASU. Enhanced 35mm images are credit NASA/JSC/ASU/GoneToPlaid. Original image. Parabolic curves applied. Parabolic curves, close-up of Ina. 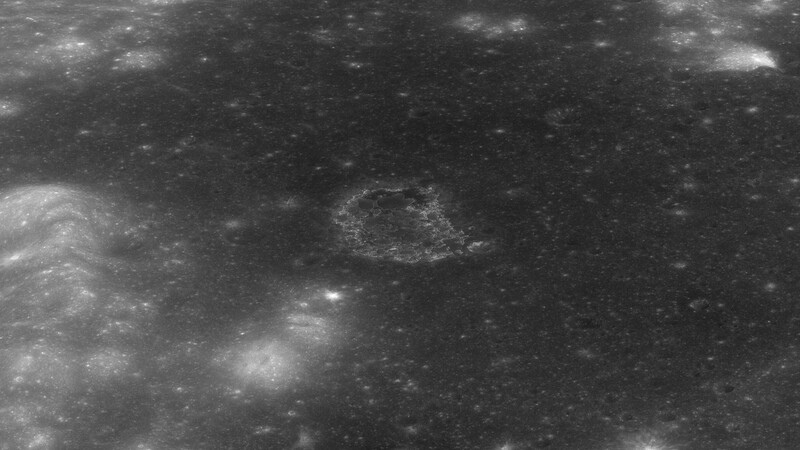 A fairly accurate lunar topophotomap of Ina was created by the Defense Mapping Agency (DMA) using the Apollo 15 Panorama Camera photographs AS15-P-0176 and AS15-P-0181 shown above and further below. Although the Apollo 16 and 17 Panorama Cameras did not take any images of Ina, the lower resolution Apollo 17 Metric Camera did take additional images of Ina. So for nearly 40 years and prior to the LRO, the few Apollo 15 Panorama Camera images of Ina were the only high resolution images of Ina which have been available to researchers for study. 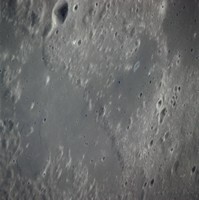 How good were the lunar topophotomaps which the DMA produced? Pretty good, considering that all of the technology was not only mechanical and analog, but also relied on the human eye's perception of apparent slope angles based on changes in terrain brightness as seen in the Metric Camera and Panorama Camera photographs. Interestingly, the DMA topophotomap's lowest marked point within the Ina caldera is fairly close to the lowest point shown in the LRO team's DTM of Ina. 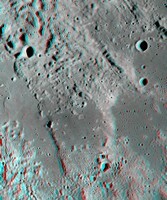 Following are the DMA's topophotomap of Ina which was produced for NASA in 1974, and a Digital Terrain Model (DTM) which was created by the LRO Team from LRO Narrow Angle Camera images. 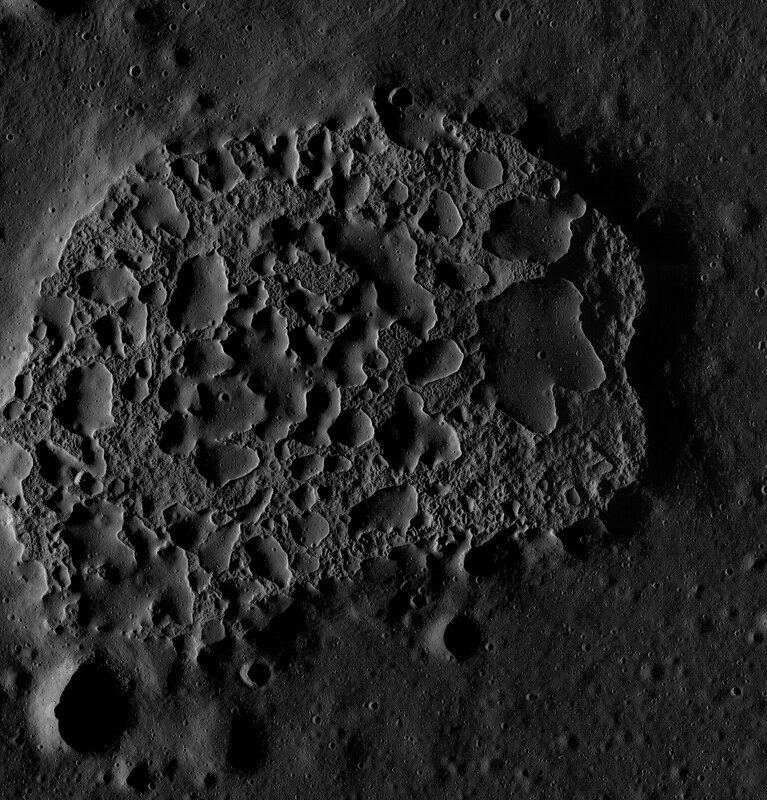 Even though the LRO Team's DTM has a slope resolution of only 2 meters in comparison to the nominal 1/2 meter resolution of the LRO, it is still quite apparent that the edges of the mounds and of the caldera wall have sharp and steep slopes. Space weathering in the form of constant micrometeorite bombardment should have long ago pummeled these sharp and steep slope features into eroded terrain with much shallower slopes. 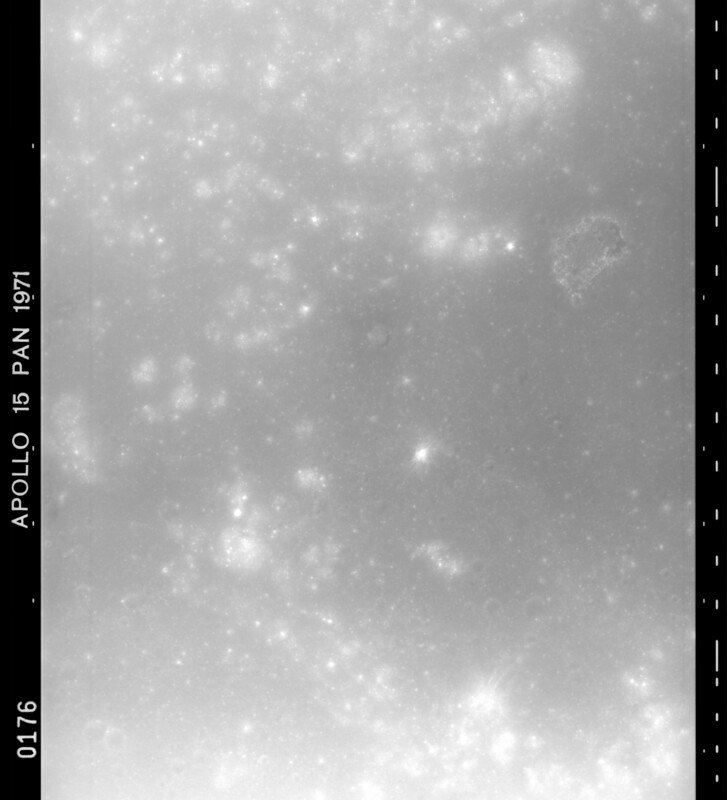 1974 DMA topophotomap of Ina. Credit: NASA/Defense Mapping Agency. LRO Team elevation and slope maps of Ina. Below are higher resolution versions of the LRO team's elevation and slope maps which are shown to the upper right. The slope map (below right) is remarkable since it indicates that the higher unit mounds within Ina's caldera have slopes at their edges of up to 54° at extremely fine scales. 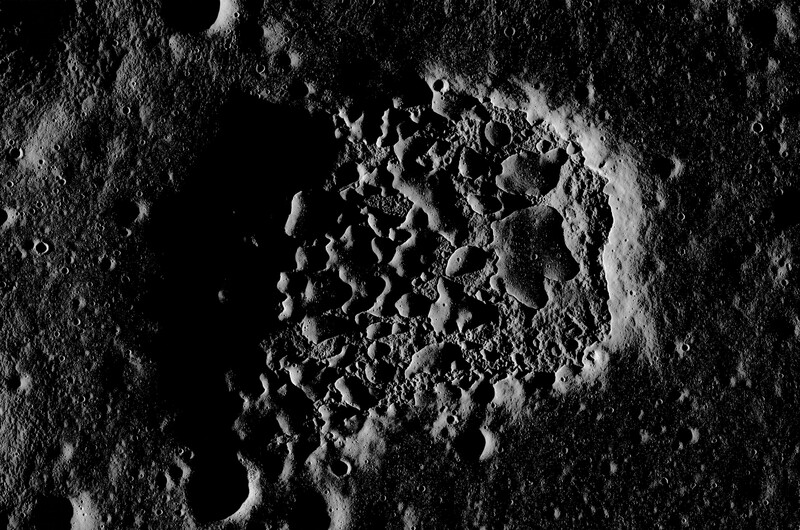 Even more remarkable are the slopes within several craters surrounding Ina's caldera which also show evidence of melt ponds in their centers. 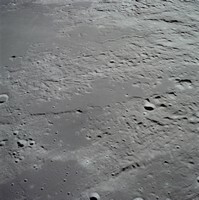 So riddle me this -- what could cause some of these surrounding craters to have depth to width ratios greater than the average 1:10 ratio which is found elsewhere on the moon? This just doesn't make sense -- unless one considers that sub-crust lava heating caused the centers of these craters to sink when the magma cooled down. 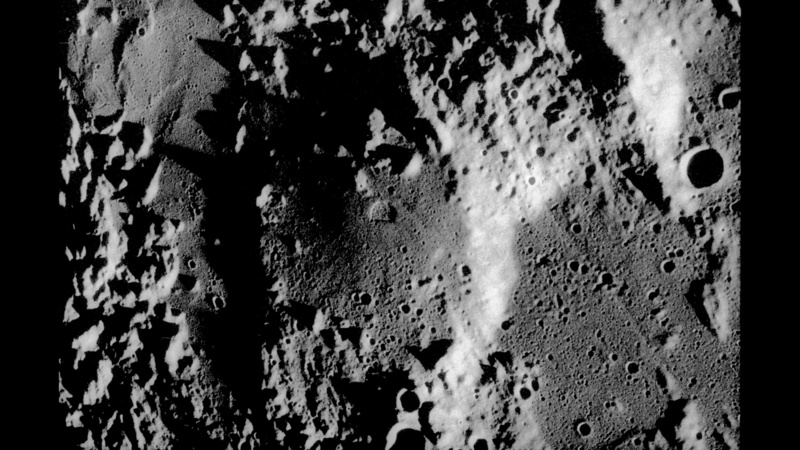 I am just throwing this idea "onto the wall" to see if this idea might stick, especially since the LRO photos hint that Ina's original caldera was much larger. Why do I suggest that Ina's original caldera might have been much larger? Because "elephant skin" textures are found outside of the present caldera. Credit: NASA/GSFC/Arizona State University. LRO Team slope profile of Ina. The morphology within the Ina caldera can be broken down into three distinct types of terrain as shown below. The most distinctive features are Ina's mounds which have been the subject of research papers for decades. Ina's mounds, generally being higher than the surrounding terrain, are frequently referred to as the upper or higher unit. The lava flows on the caldera floor are generally referred to as the lower unit. Yet the patches of bright blocky material across the caldera floor almost always have a lower elevation than the adjacent lower unit of caldera floor lava flow material. Sketch map showing the distribution of Ina's three morphologic units. Credit: NASA/GSFC/Arizona State University. Many theories postulate that that the mounds which comprise the upper unit were created by upwelling lava from below. We shall see that the photographic evidence indicates that this is not the case. We shall also see that the photographic evidence strongly indicates that the lower unit of lava floor material and the blocky material were much more recently created than the mounds. Based on the observed cratering rates seen in the LRO images for the upper unit mounds versus the lower unit caldera floor, there is no way around this conclusion. The difference in cratering rates is so blatantly obvious that crater counts don't have to be performed in order to reach this conclusion. Yet there is more. I hypothesize that the lower unit of lava floor material and the blocky units are what is left of partially to fully melted mound or higher unit material which at one time covered the entire caldera. I also hypothesize that there is some photographic evidence which hints that long ago Ina had a larger caldera. Below, I will work up to these hypothesized conclusions by presenting photographic evidence in support of these hypothesized conclusions. Image processing and enhancement indicates that there is a slight dearth of cratering on the Ina plateau in comparison to the surrounding mares of Lacus Felicitatis. Have a close look at the following images. 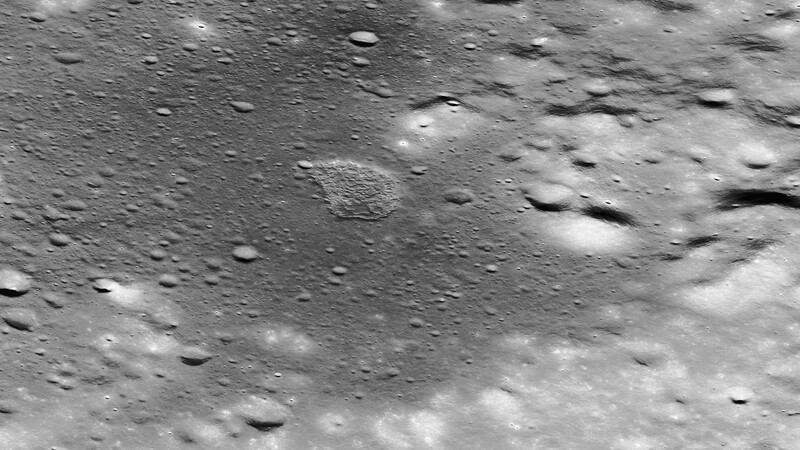 While it appears that the eastern mare region of Lacus Felicitatis may be slightly younger than the western mare region, this apparently is an optical illusion caused by the LRO Wide Angle Camera's much more oblique view of the eastern mare region of Lacus Felicitatis which clearly has many more large craters in comparison to the western mare region. 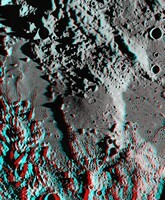 The following photos show a slightly lower cratering rate immediately around and to the upper right of Ina in comparison to the rest of the Ina plateau. This suggests that the terrain immediately around Ina is somewhat younger than the terrain on the rest of the Ina plateau. Lunar cratering eventually reaches a steady state in which old craters are destroyed as fast as new craters are created. In other words, enough new craters over time will destroy all traces of much older craters. The smaller the crater size of new craters versus existing older craters of the same size, then the less time it takes for new craters to destroy all traces of older craters of the same size. It also has been established that the cratering rate within the inner solar system is consistent. 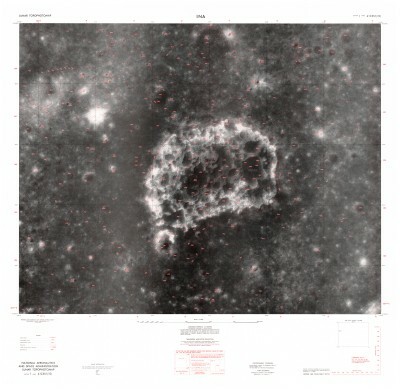 The lower cratering rate on the Ina plateau in comparison to the rest of the Lacus Felicitatis mares indicates that the Ina plateau is younger than the surrounding mares. 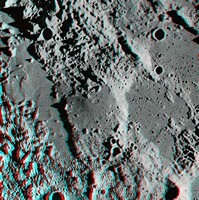 The slightly lower cratering rate immediately around Ina in turn suggests that the terrain immediately surrounding Ina is slightly younger than the rest of the plateau. It is unknown if the plateau was created by Ina, but some theories indicate that this is the case. If the plateau was created by Ina, then the lower cratering rate immediately surrounding Ina implies that Ina has had at least two significant volcanic events in Ina's past. North is up. Views look towards the east. LRO slew angle was 59° towards the east. Images credit NASA/GSFC/ASU/GoneToPlaid. ** D. The red areas can be used to determine the average age for the Lacus Felicitatis western mare. The green areas can be used to determine the age for the oldest features on the Ina plateau. The blue areas hopefully can be used to determine the age for the oldest features seen within the present Ina caldera. It should be noted that other LRO photographs indicate that subsequent and much more recent events appear to have occurred within the caldera, and that there are hints that Ina long ago had a much larger caldera. The indicated areas are rather large. Ideal areas within the indicated areas should be selected by visual examination for crater counting. One has to admit that, in the above photos, the region surrounding the top, bottom, and eastern sides of Agnes (the largest mound within the Ina caldera) exhibits the lowest albedo in comparison to everything else in the above photos. This lower albedo suggests that this region is very young. "How fresh is fresh? That is the question for surface deposits seen across both large and small regions within Ina's caldera. The moon is a non-Lambertian reflector. Why? 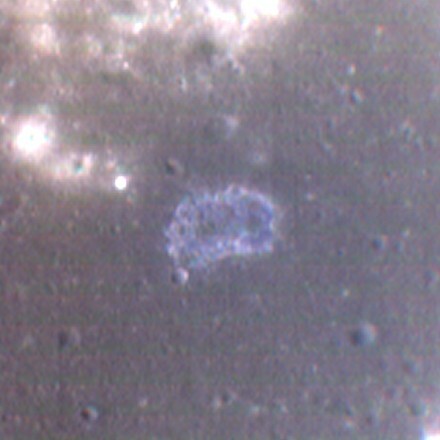 Because very small to microscopic glass beads in the lunar regolith, the result of aeons of micrometeorite bombardment which melted lunar regolith to create these glass beads, cause a phenomenon called Heiligenschein in which sunlight striking the moon's surface tends to be strongly reflected back towards the light source (the sun). Imagine shining a flashlight onto a bunch of marbles which you have scattered on top of soil in your backyard. You will see that the marbles reflect your flashlight's light source rather well and right back towards you and your flashlight since glass marbles are inherently shiny in appearance. All Apollo era surface EVA and orbital photographs exhibit strong Heiligenschein effects for areas which are down-sun within the photographs. 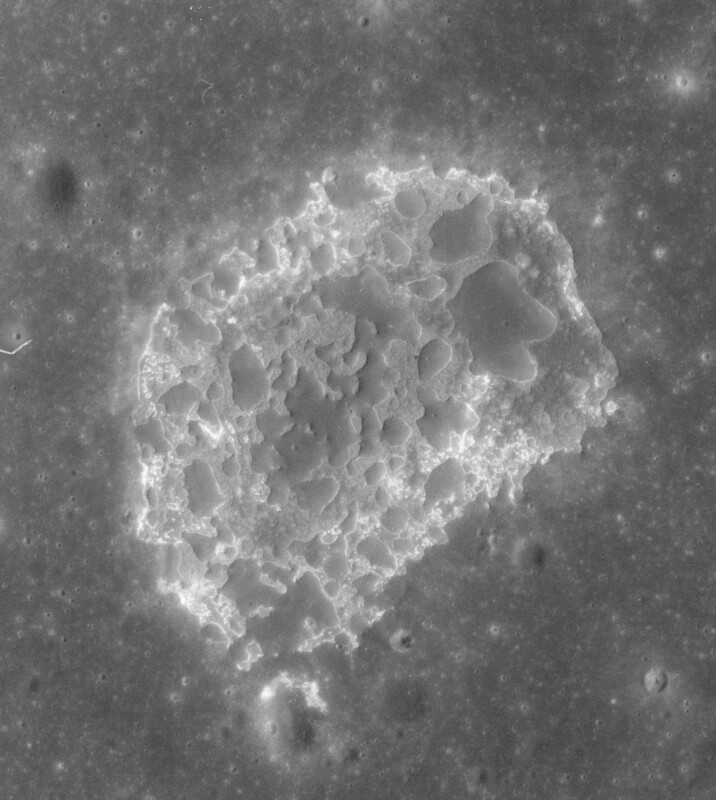 Can Heiligenschein (or the significant lack thereof) and the relative albedo (reflectance) intensities as seen in Apollo and LRO photographs be used to identify regions within Ina's caldera which were more recently created and which haven't yet been subjected to aeons of micrometeorite bombardment? The short answer is yes. Apollo 15 Panorama Camera images AS15-P-0176 and 0181. Solar illumination is from the right. Images credit NASA/JSC/ASU/GoneToPlaid. 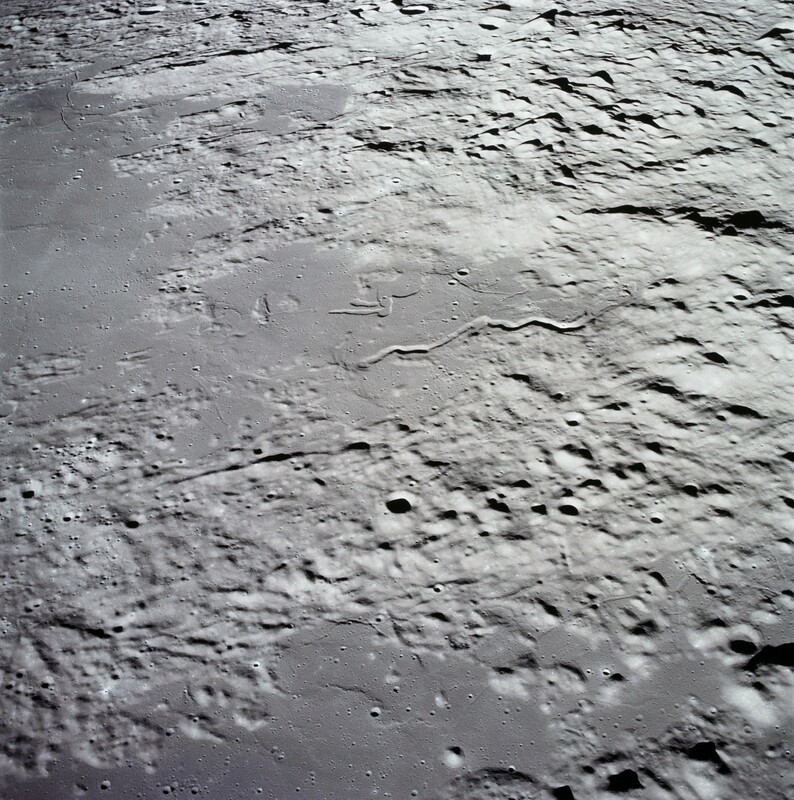 Close-ups of the centers of the two Apollo 15 Panorama Camera images which were used to create the Defense Mapping Agency's topophotomap of Ina. The ITEK Panorama Camera's field of view is 10.77° (horizontal axis in the above image frames). 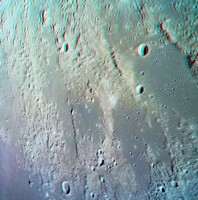 Close-up Panorama Camera views of Ina. These views have been reprojected as if Ina had been at the center of the Panorama Camera's field of view. 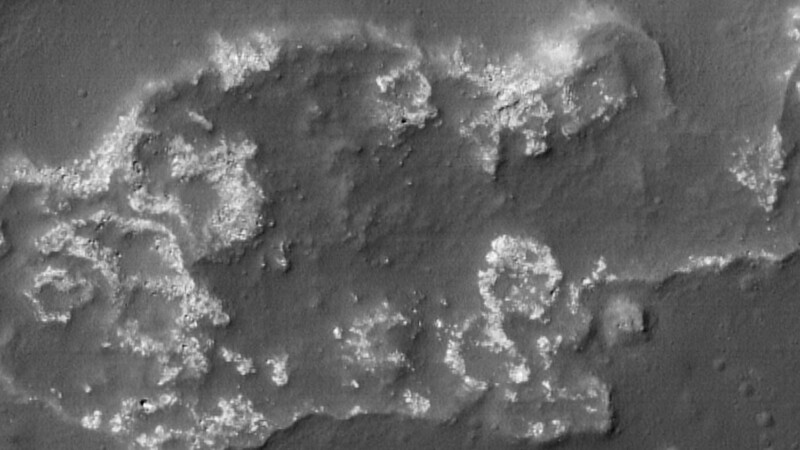 These images then were enhanced and adjusted so that the surrounding terrain has similar brightness and contrast in order to reveal the differences in albedo within the caldera due to the different emission angles of these two images. A side-by-side comparison of these two Panorama Camera Aft and Forward photos reveals that features within the Ina caldera exhibit striking changes in albedo with changing emission angle even though the incidence angle is identical. 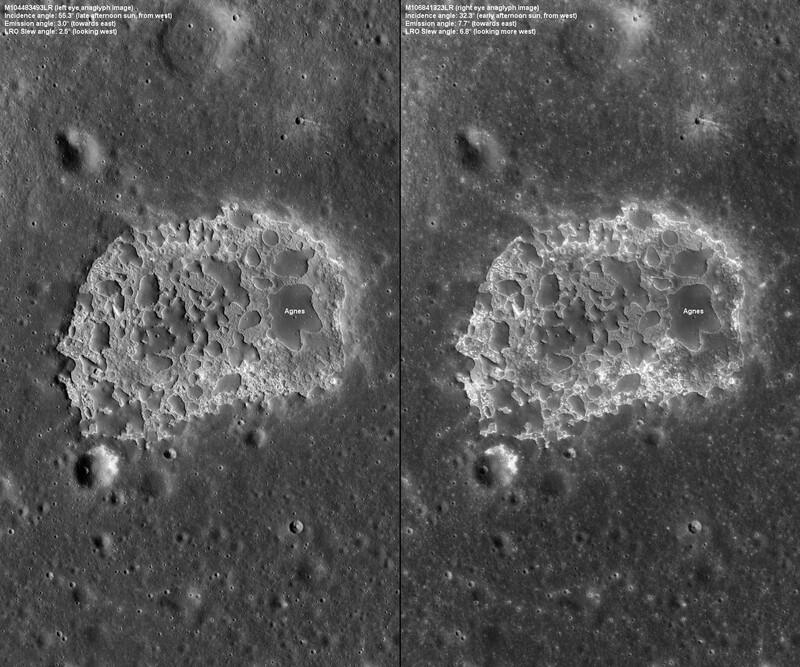 Compare to the side-by-side LRO images, below. 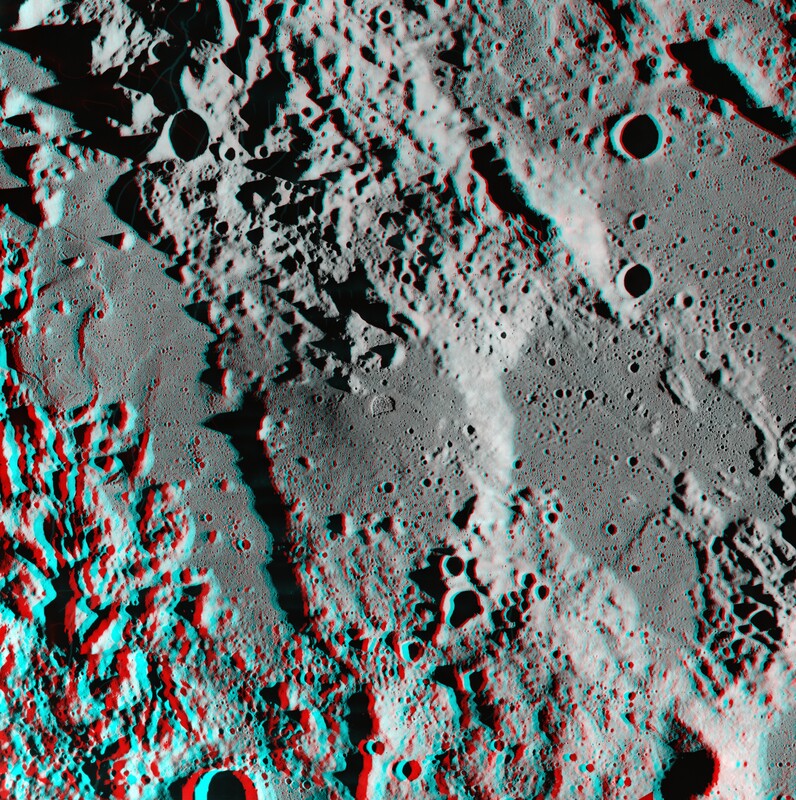 A remarkable amount of depth and detail is visible in these 3D anaglyphs which I created from the above reprojected images. LRO images M106841323 and M104483493. North is up. Images credit NASA/GSFC/ASU/GoneToPlaid. 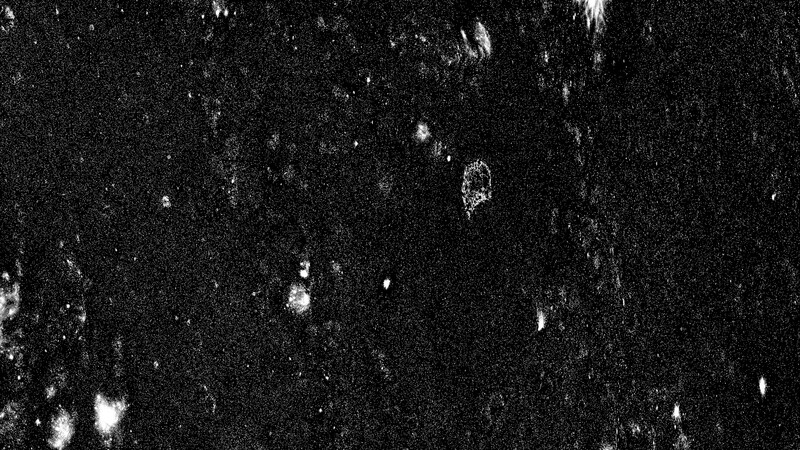 These are the first two LRO images of Ina. They have been positioned side-by-side for comparison. 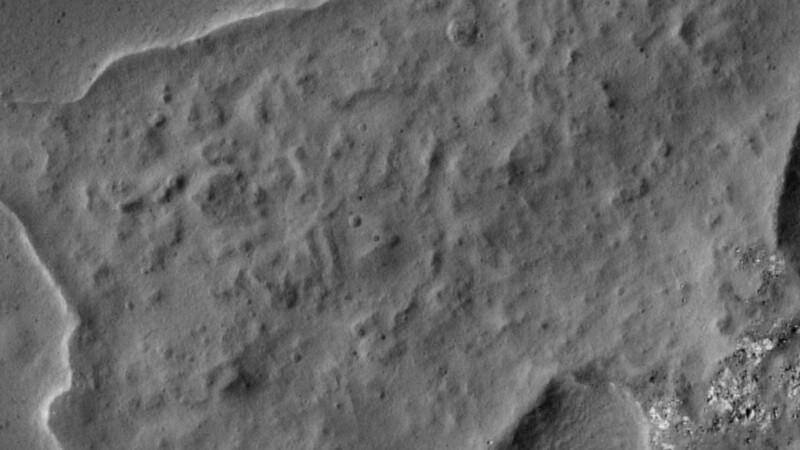 Both images have had their dynamic range and contrast adjusted so that the terrain surrounding Ina appears to have similar brightness and contrast. The direction of solar illumination in these LRO images is from the West instead of from the East as in the above Panorama Camera images. 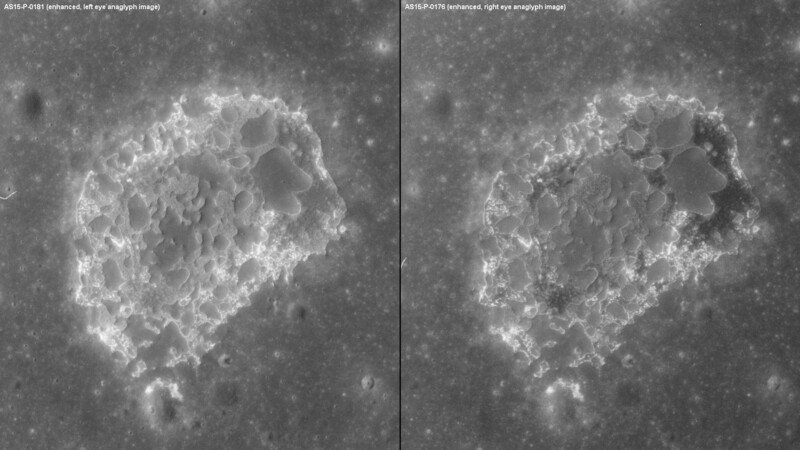 Both of these LRO images are looking a bit West towards Ina and have only a 4.3° difference in the viewing or emission angle. (Sorry, this is not enough stereo separation for a good 3D anaglyph.) What is significantly different between these two images is the 23° difference in the incidence angle which results in a significant difference between the solar incidence and emission angles for each image. 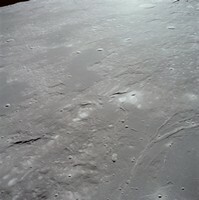 As with the Panorama Camera images above, one can see significant albedo differences within the caldera versus the surrounding terrain. In a nutshell, the smaller the difference is between the incidence and emission angle when photographing Ina, then the darker the appearance of the majority of the lava floor terrain within the caldera will be in comparison to the terrain surrounding the caldera. This darkening is particularly pronounced for the lava floor terrain surrounding Agnes. What causes this darkening effect relative to the surrounding terrain? A lack of Heiligenschein for the young lava floor terrain in comparison to the older terrain surrounding the caldera. You might notice that the blocky areas appear to be brighter in the right image. This is an illusion since the boulders in the blocky areas are casting much shorter shadows in the right image in comparison to the left image, thereby allowing more blocky terrain to be illuminated by sunlight in the right image. Since the Heiligenschein effect, produced by glass beads created by aeons of micrometeorite bombardment, causes light to be strongly reflected back towards the light source, we would expect that any LRO photos of Ina in which the sun is behind the LRO should exhibit strong Heiligenschein for old terrain and much less Heiligenschein for young terrain. 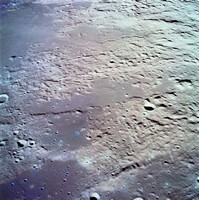 Such young terrain, if present, should be seen within Ina's caldera if any of the terrain within the caldera is young. 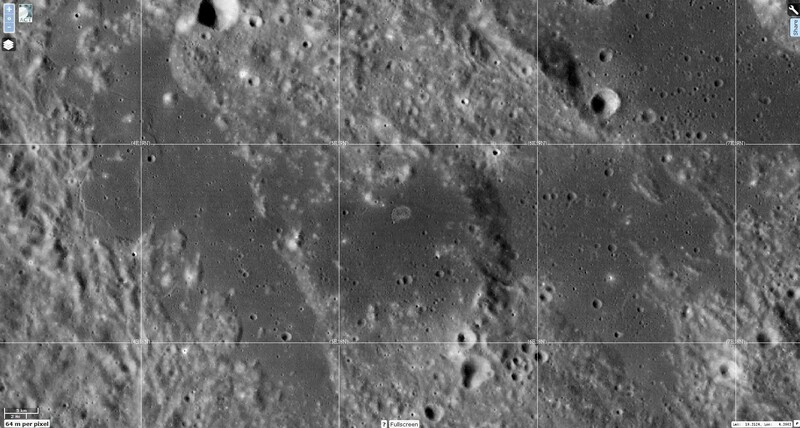 Do we see indications of young terrain in other LRO photographs, and in particular in any oblique views of Ina which were photographed by the LRO? 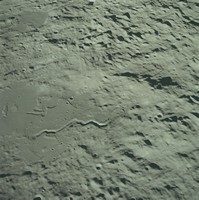 Again the answer is yes, as seen in the following LRO photographs. North is to the left. LRO slew angle: 59° east. Images credit NASA/GSFC/ASU/GoneToPlaid. 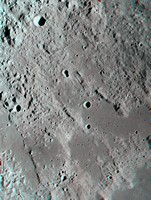 You will note that the terrain above and to the right of the largest mound, Agnes, not only appears to be a bit darker than the terrain surrounding the caldera, but also appears to be significantly darker than the rest of the terrain within the caldera. 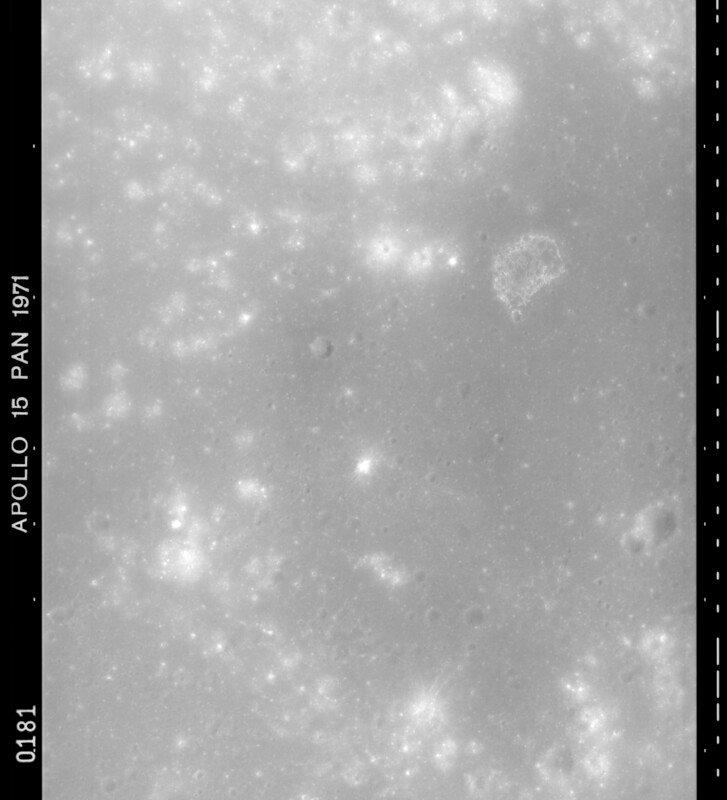 This photo was shown further above, but is shown again since it will be useful to compare this image to the following photographs in which the LRO was looking West towards Ina and with the sun behind the LRO's cameras. 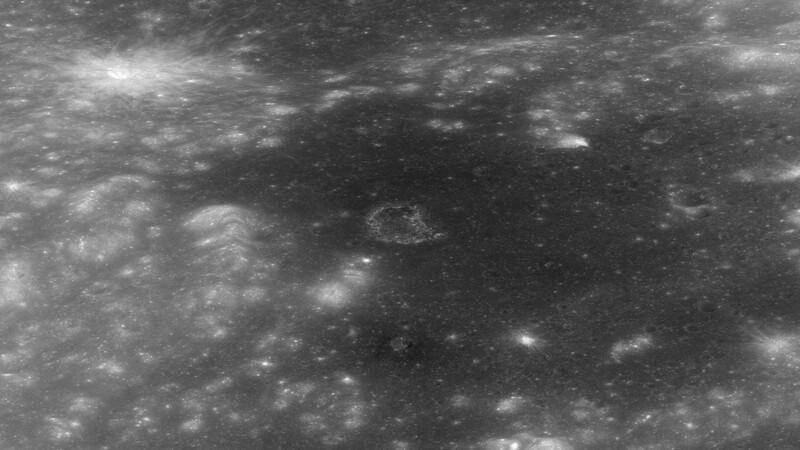 In the following pairs of calibrated LRO images and enhanced versions of these calibrated LRO images, image enhancement similarly reveals areas of young terrain which do not exhibit a strong Heiligenschein effect towards the light source (the sun) which was behind the LRO when the following images were taken. 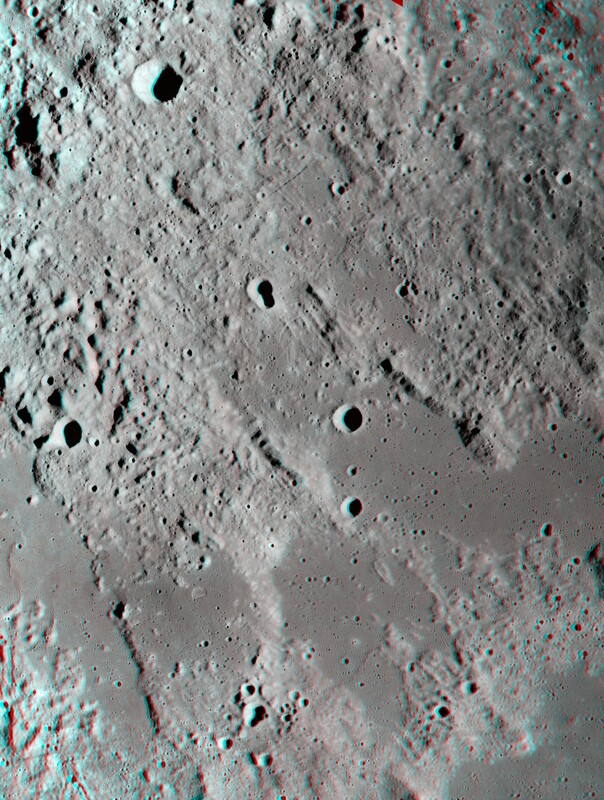 LRO slew angle: 55° west. Images credit NASA/GSFC/ASU/GoneToPlaid. 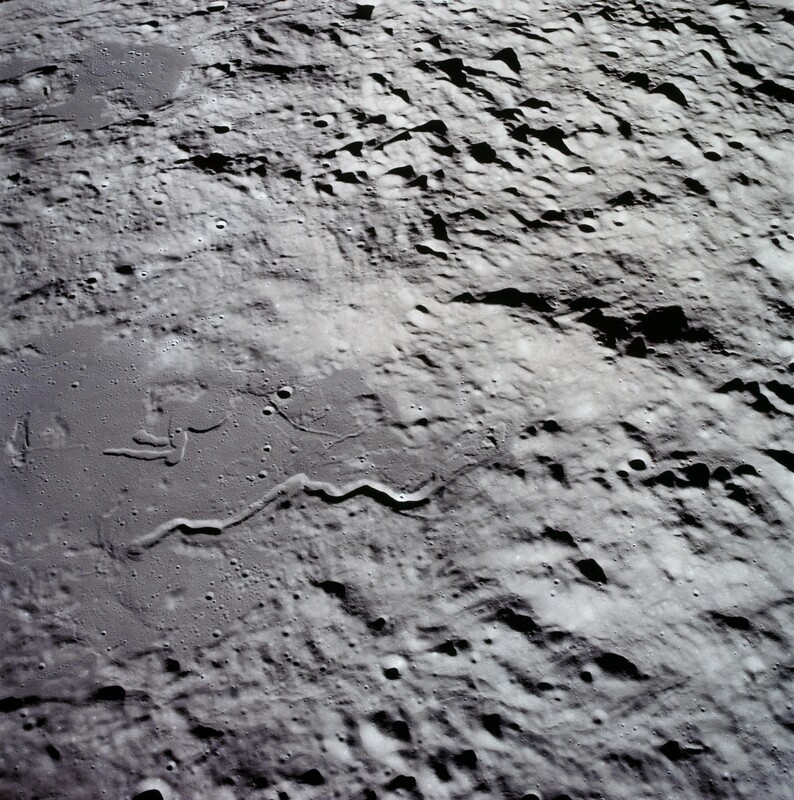 Calibrated LRO images. Agnes is the largest mound, located in this image near the bottom of the Ina caldera. Without image enhancement, nothing really stands out to the human eye regarding features within the caldera. This is not the case when one examines enhanced versions of these images which are presented below. Enhanced with modified Gaussian curves. Images credit NASA/GSFC/ASU/GoneToPlaid. 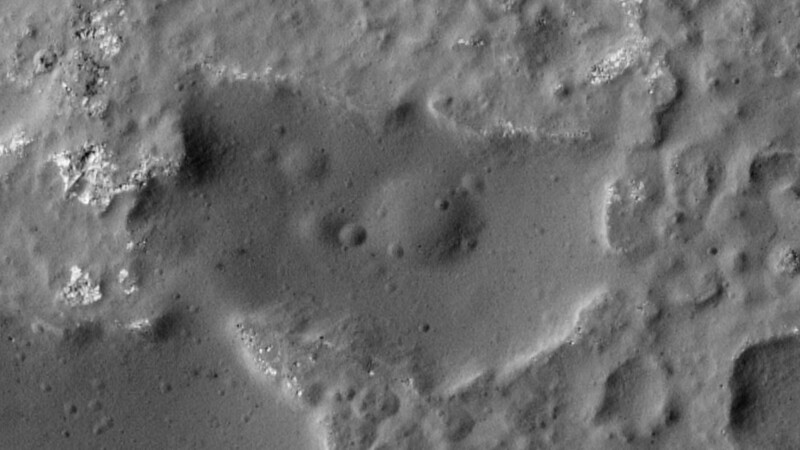 Calibrated LRO images with modified Gaussian curves applied. After applying the modified Gaussian curves, it now becomes readily apparent that the terrain near Agnes exhibits significantly less Heiligenschein in comparison to the rest of the terrain within the Ina caldera and the surrounding terrain. Note the decrease in Heiligenschein and subsequently the albedo for the two nearest mounds, the largest of which is Agnes. This suggests that a fine layer of fresh material has been deposited on these nearest mounds. Do you also see other areas on the caldera floor which also appear somewhat darker than other areas? At left are much larger area versions of the above pair of close-ups of Ina. The dark terrain around Ina corresponds to the the blue colored regolith seen around Ina in the enhanced Apollo 17 Hasselblad images further above. The implication is that this blue colored regolith with high titanium content is a relatively fresh top layer of regolith with a lower Heiligenschein effect than the surrounding terrain. In other words, this dark terrain is very young in age since it exhibits significantly less Heiligenschein. If this darker terrain was older, then micrometeorite impacts over the past 100 thousand to 1 million years would have created near microscopic glass beads which would have significantly increased the Heiligenschein effect. Overall, the above images suggest that the most recent volcanic activity within the Ina caldera was around the largest mound, Agnes. Do we see the same lack off a Heiligenschein effect around Agnes in the Apollo 15 Metric Camera photographs of Ina? You bet we do. The solar incidence angle is constant in the following four photographs which were sequentially taken during the same Apollo 15 CSM orbit. The late morning sun's elevation above Ina's terrain was approximately 64°. 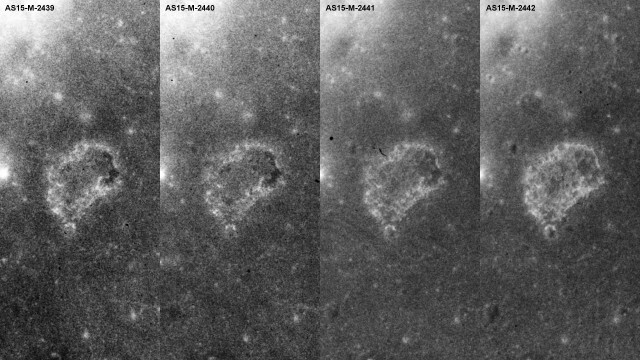 Note that the terrain to the right of Agnes becomes progressively lighter in appearance within the following four sequential Metric Camera close-up photographs as the difference between the solar incidence and emission angles increases. In other words, the area around Agnes is behaving much more like a conventional Lambertian reflector and with no Heiligenschein effects, rather than like the moon's generally non-Lambertian reflector characteristics which also exhibit strong Heiligenschein effects. 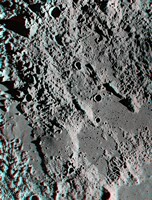 The albedo of other features within the caldera changes with varying emission angle relative to the more optically mature surrounding terrain, as seen in the following Metric Camera photo sequence. The solar incidence angle was constant. The albedo differences with changing emission angle indicate that not only are the features within the caldera younger than the surrounding terrain, but also that some features within the caldera are younger than other features within the caldera. Apollo 15 CSM Lunar Orbit #70. 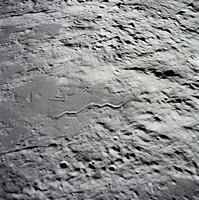 Early morning and late afternoon LRO photographs of the lunar surface inherently result in high contrast images since the sun is very low in the lunar sky. Such photographs have a high incidence angle for the sunlight which is illuminating the lunar terrain. When the sun is directly overhead, the incidence angle is zero. When the sun is very low above the local lunar horizon, the incidence angle is very high (up to 90°). Can very early morning or very late afternoon (high incidence angle) photographs of the moon's surface reveal more information about the terrain and geology? Absolutely yes. And this is particularly the case with Ina. 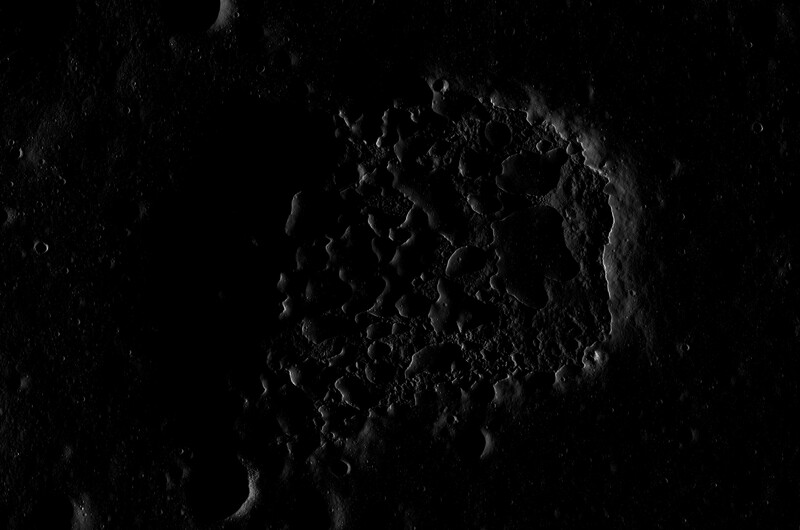 One striking observation which you will see in the following sunrise and sunset images is that while the caldera mounds are peppered with many small craters, the caldera floor shows very few actual craters, in particular on the terrain east of Agnes. 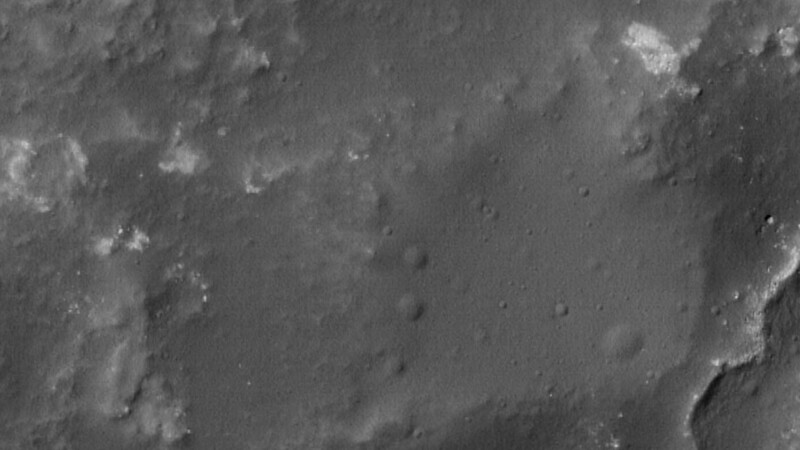 In lower incidence angle images of Ina, what is in fact inherently rough terrain on the caldera floor can be easily misinterpreted to be small craters. Sunrise over Ina. LRO Image M116282876LCRC. 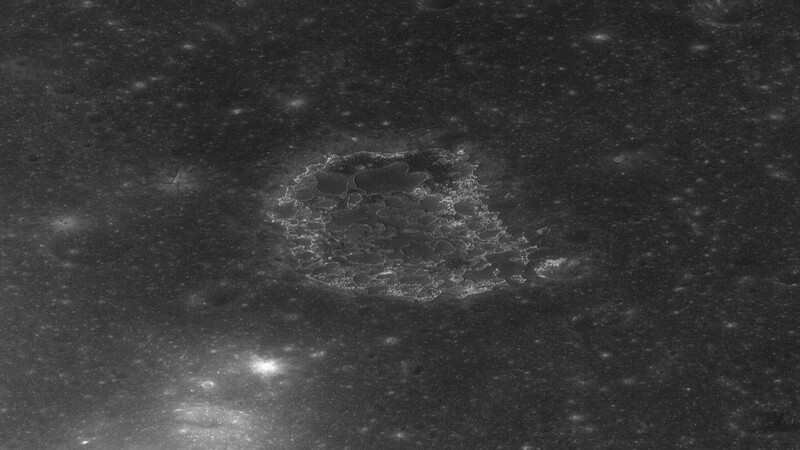 The following LRO images have been deconvolved and enhanced. Sharp and steep slopes, and beaches adjacent to these steep slopes, are observed along the edges of the mounds. The transition zone between the edges of the sharp slopes and the beaches generally is 1/2 meter in width. In some areas this transition zone appears to be a bit less than 1/2 meter in width, or definitely down to the limiting resolution of the following deconvolved and enhanced images. Deconvolved**, fft noise removal, gamma enhancement. 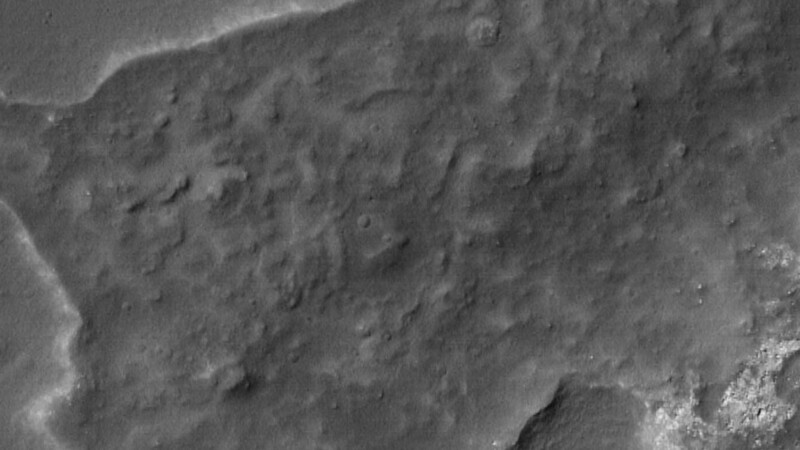 Image scale: 0.500 meters per pixel. Download this image. Deconvolved**, fft noise removal, gamma enhancement. 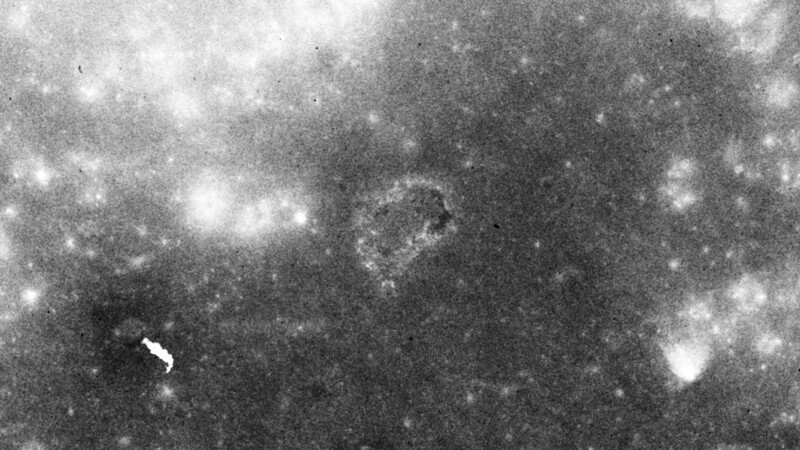 Image scale: 0.250 meters per pixel. Download this image. ** Image deconvolution had to be stopped before full completion since the image floor noise started to become too intense, even with noise clipping. Selected regions of interest within the above image. Image scale of the following images: 0.250 meters per pixel. Do you see the two distinctly different types of volcanic terrain which were created by two separate eruptions in the above photograph of the area just north of Agnes? What appear to be craters within the bubbly looking lava flows near the center of the image are NOT craters. They are the result of gaseous venting. Do you see the string of vents and associated nearby smooth terrain in the above photograph which is of the terrain close to the lowest point within the caldera? This isn't the only string of vents which are visible on the caldera floor. Sunset over Ina. LRO Image M132800178LCRC. The left image below is how the LRO's NAC cameras actually saw Ina when the setting sun was only 3° above the western horizon. The other images are enhanced versions of this image. A. Deconvolved. Image scale: 0.500 meters per pixel. Download this image. B. Deconvolved, gamma curves. Image scale: 0.500 meters per pixel. Download this image. C. Deconvolved, modified Gaussian curves. 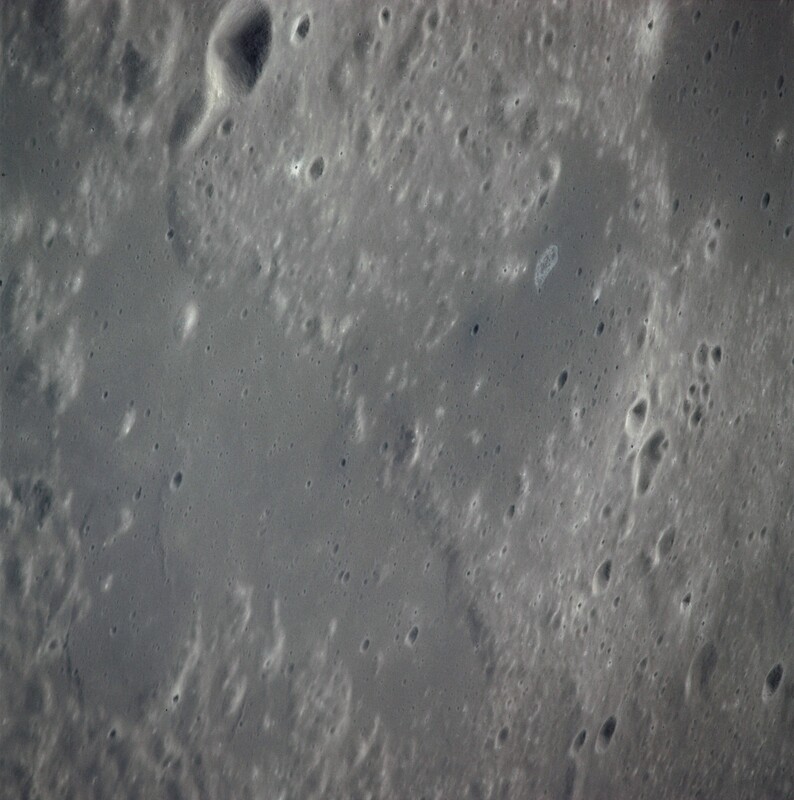 Image scale: 0.500 meters per pixel. Download this image. D. Deconvolved, modified Gaussian curves, strong gamma. Image scale: 2.000 meters per pixel. In particular, pay attention to what you see in the above right image (D) which has been strongly enhanced. 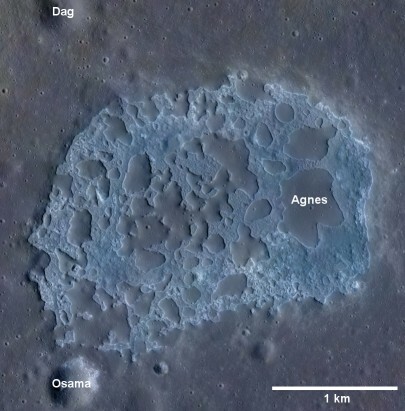 Visually compare the cratering rates seen on the largest mound, Agnes with the cratering rates seen to the left and to the right of the caldera. While it appears that Agnes is younger than the terrain surrounding the caldera, it is really hard to say. Also note the terrain at the upper left in B, C and D. In particular, note where rough terrain suddenly meets smoother terrain to the east with shadow boundaries which indicate that the smoother terrain to the east is slightly higher in elevation than the rough terrain. Could this be the edge of a larger yet much older caldera? 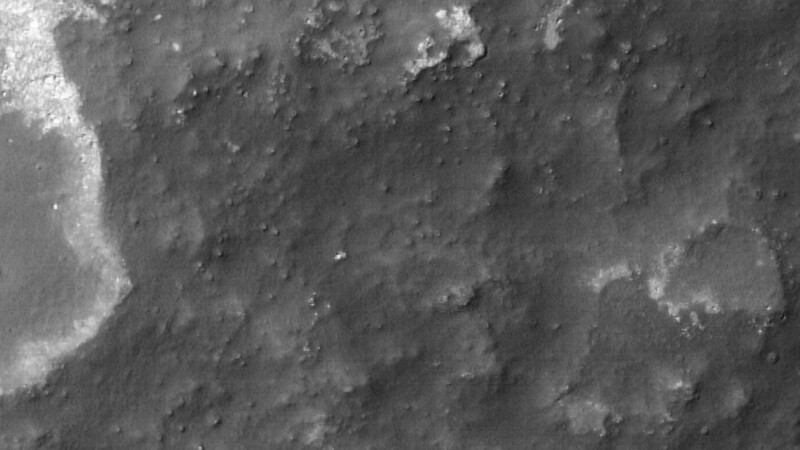 LRO image M113921307LCRC is perhaps one of the best LRO images to examine since this LRO image features an ideal solar illumination angle for examining the complexity of the terrain within Ina's caldera. Researchers should pay close attention to what is shown in the following images. The strongly enhanced images highlight the curvature of the mounds. The high pass filtered images highlight the texture of the caldera floor and the elephant skin texture near the edges of the mounds, and clearly show the difference in the cratering rates of the mounds, the caldera floor, and the terrain surrounding the caldera. Note the slight drop off in the cratering rate near the edges of the largest mound, Agnes, and in particular on or near the elephant skin regions..
Deconvolved. 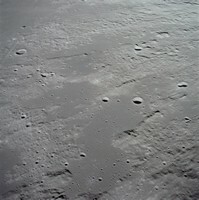 Image scale: 0.500 meters per pixel. Download this image. Deconvolved, enhanced. Image scale: 0.500 meters per pixel. Download this image. Deconvolved, more strongly enhanced. 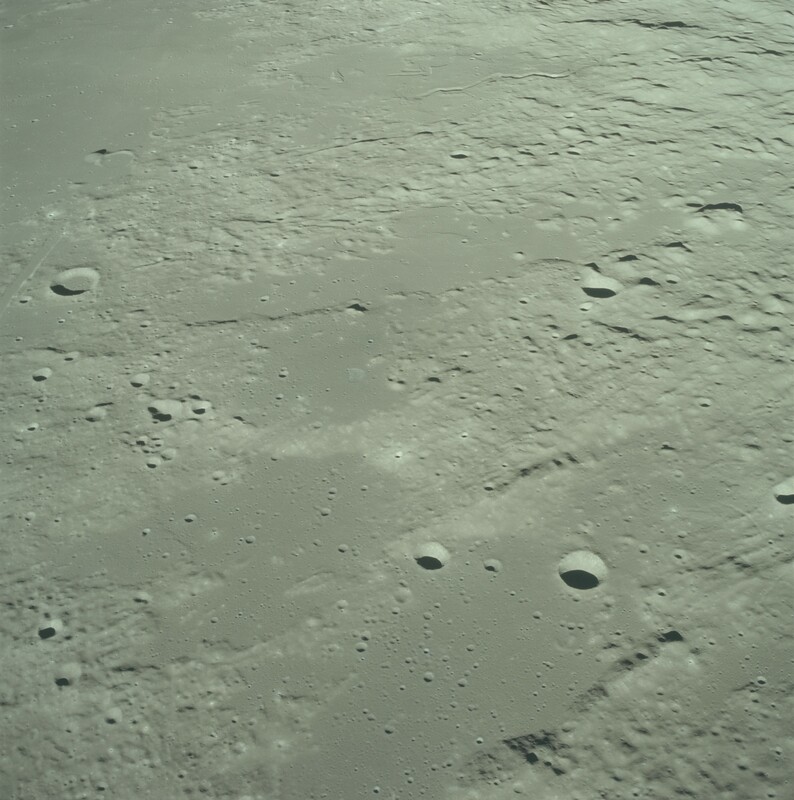 Image scale: 0.500 meters per pixel. Download this image. Deconvolved, highpass filter plus original image screened in. 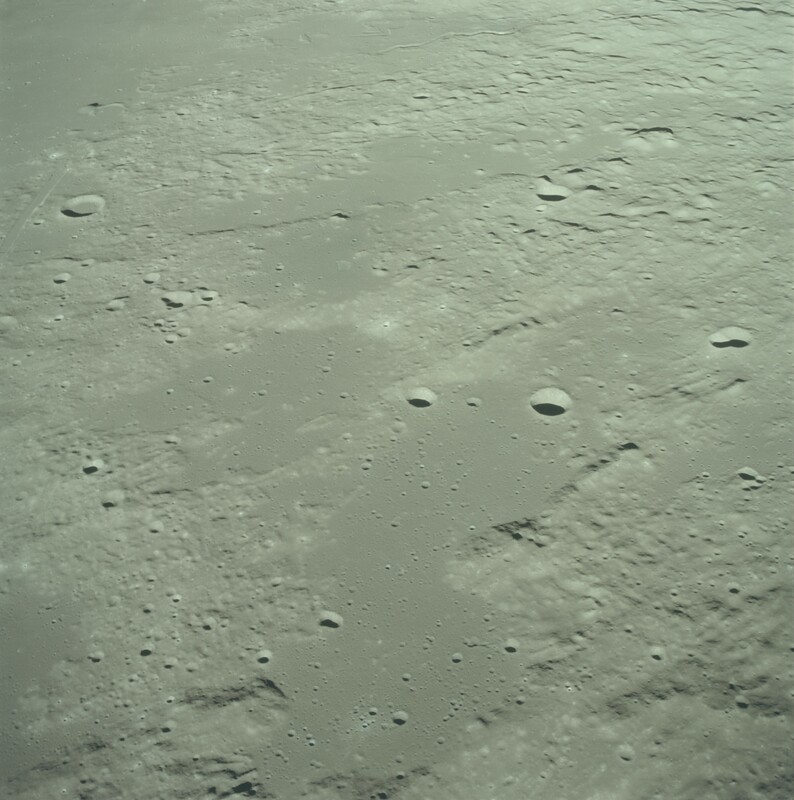 Image scale: 0.500 meters per pixel. Download this image. Deconvolved. Image scale: 0.250 meters per pixel. Download this image. Deconvolved, enhanced. 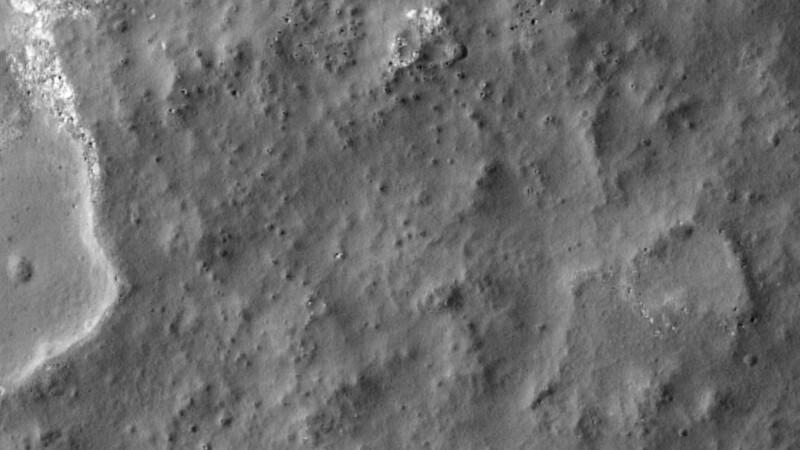 Image scale: 0.250 meters per pixel. Download this image. Deconvolved, more strongly enhanced. 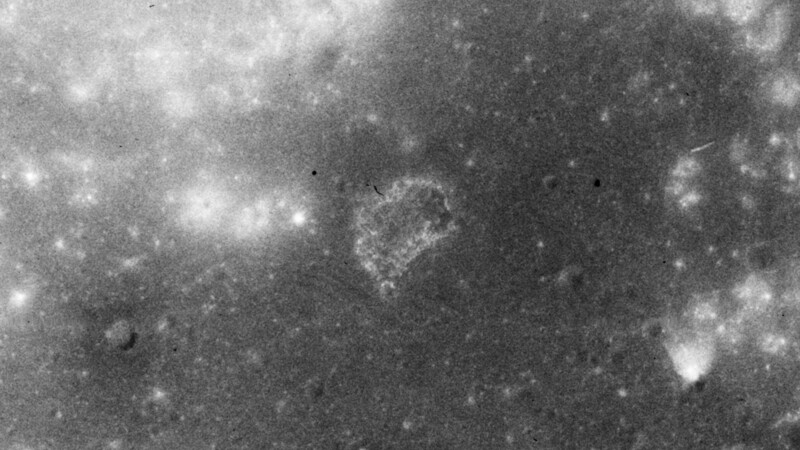 Image scale: 0.250 meters per pixel. Download this image. Deconvolved, high pass filter plus original image screened in. 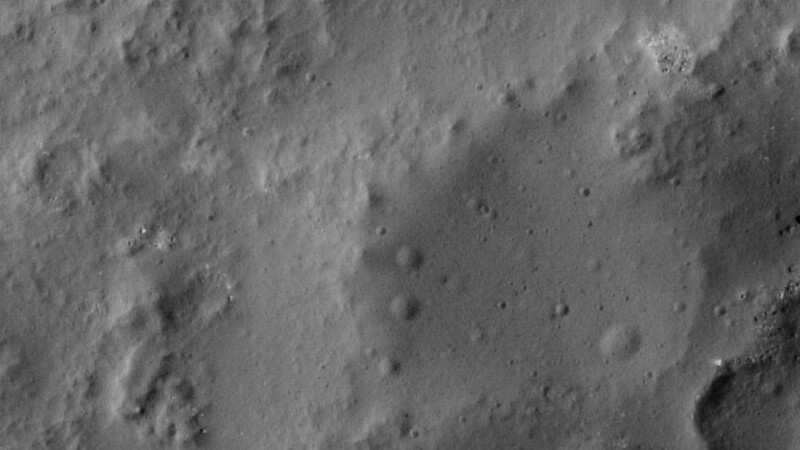 Image scale: 0.250 meters per pixel. Download this image. 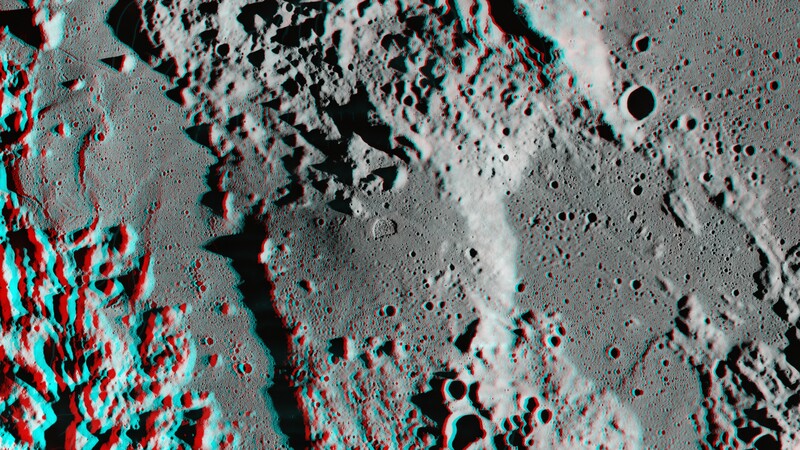 Let's have a look at 3D anaglyphs of the areas within Ina which were shown in the paper titled "The origin of Ina: Evidence for inflated lava flows on the Moon." 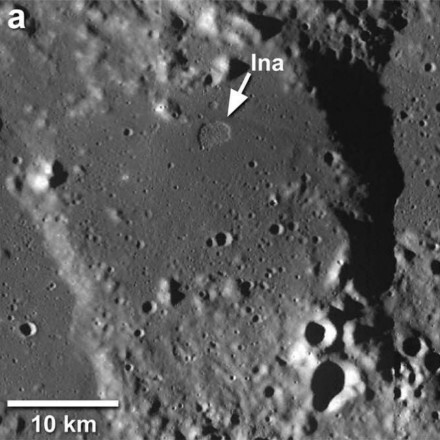 Below are Figures 1a and 1b from the research paper titled "The origin of Ina: Evidence for inflated lava flows on the Moon." This research paper is available via the link near the top of this page under the section titled "LRO Era Theories About Ina." Also shown are corresponding 3D anaglyphs for Figure 1a, and a corresponding WAC color image for Figure 1b which I decompanded and color balanced. Figure 1a: LROC WAC monochromatic mosaic (M117454036ME, M117467600ME, 415 nm band). Figure 1b: Uncalibrated LROC WAC mosaic (M150490747CE, M150483953CE) color composite: red: 690 nm, green: 605 nm, blue: 415 nm. 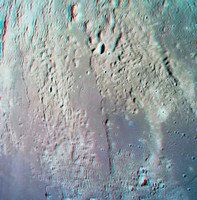 (below) 3D Anaglyphs for Figure 1a. LRO Images M117460804M (right eye image) and M117454036M (left eye image) were decompanded and gamma enhanced. 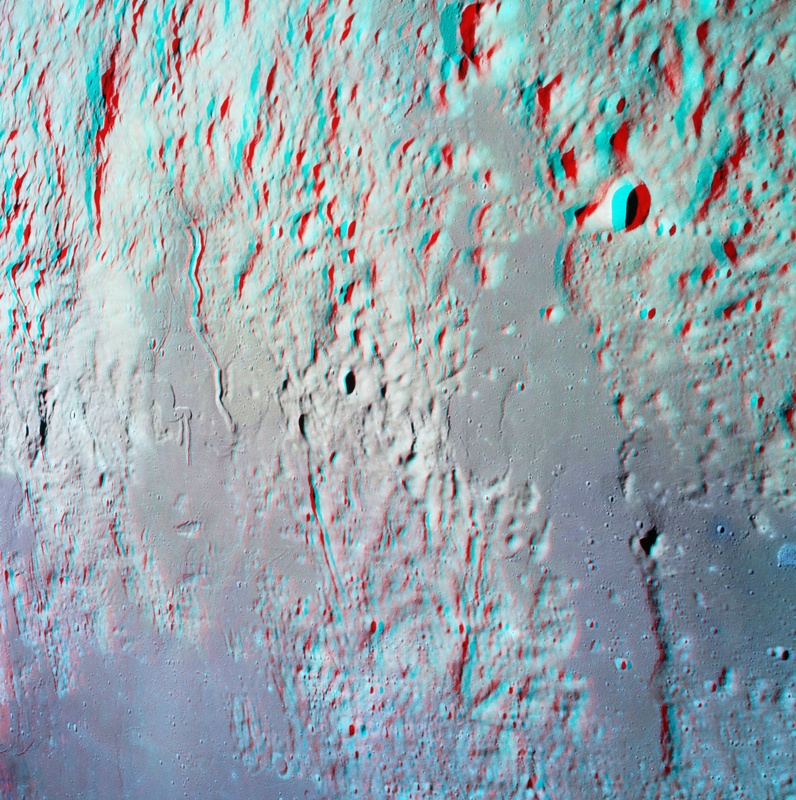 3D anaglyph of LRO WAC images M117454036M and M117460804M. Other interesting features are also seen throughout this image. A larger cropped version of the 3D anaglyph at left. (right) LRO WAC image M137515766CE. Image M137515766CE was decompanded and color balanced. I did not bother to scale this image in order to achieve the correct 1:1 vertical axis versus horizontal axis image scale ratio since I was merely after obtaining as close as possible true color view of Ina. Note that I used the 566 nm band for green since the 605 nm band used by the LRO Team actually is yellow. Below is Figure 2a from the research paper titled "The origin of Ina: Evidence for inflated lava flows on the Moon." Further below I will present alternative images for the various Figure 4's seen in the following photograph. Figure 2a: LROC NAC (M119815703) image of Ina at a resolution of 0.5 m per pixel with examples of representative units labeled. Incidence angle is 56°. 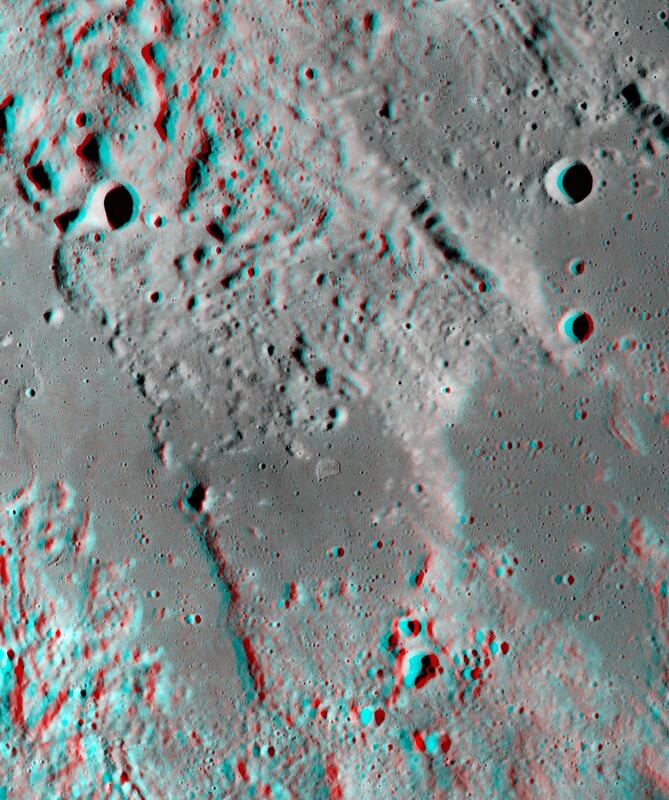 The following 3D anaglyphs were made from LRO Low Periapse Orbital Stereo Pair Images M175239283LCRC and M175246029LCRC. The LRO's altitude was just over 24.5 kilometers. 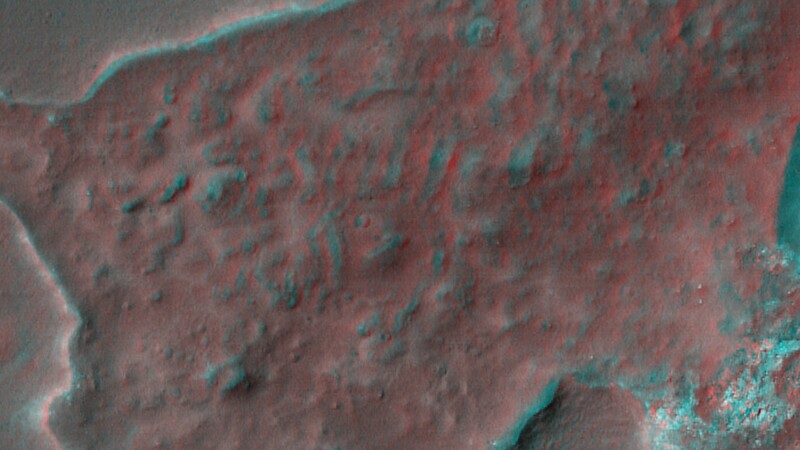 The left and right images for each 3D anaglyph are also shown since the terrain's albedo can appear to be remarkably different with changing emission angle. 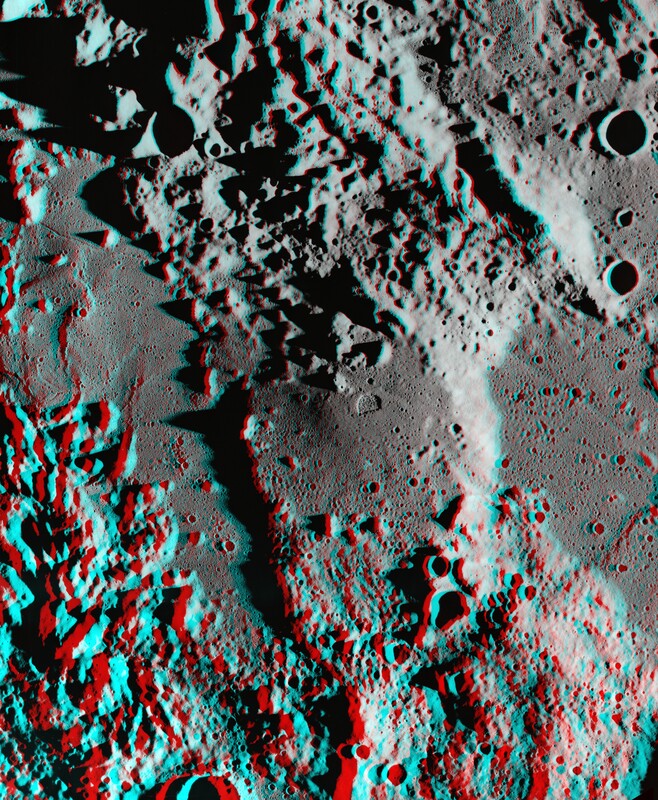 These 3D anaglyphs show strongly exaggerated terrain height since the inherent stereo separation between these two LRO stereo image pairs is approximately 60°. Imagine trying to look at your thumb when held roughly 4 inches in front of your eyes. The human brain has difficulty interpreting such extreme perspectives. Note the remarkable difference in albedo for the lower unit (lava floor) areas in comparison to the upper unit (mound) areas when you compare the left eye view (LRO looking East) versus the right eye view (LRO looking West) images. The obvious difference in albedo between the lower and upper units is the result of the difference in Heiligenschein for the different emission angles of the left and right eye view images, and are the result of the obviously different ages of the upper and lower units. Figure 4a. Image scale: 0.250 meters / pixel. Figure 4b. Image scale: 0.250 meters / pixel. 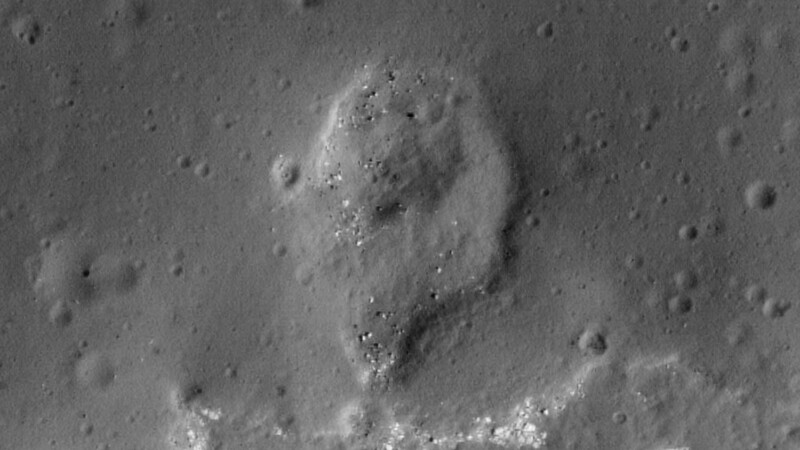 Although the older area of the lava floor (lower unit) has some small craters, the cratering rate of the mounds (upper unit) is noticeably higher. Also note that the cratering rate on the elephant skin textures appears to be less in comparison to the rest of the large mounds. Do you see the string of small vents to the right of center? Look carefully at the scalloped west edge of the dark mound at the extreme right. The edges of the mound appear to have been melted by the lava floor. Figure 4c. Image scale: 0.125 meters / pixel. Figure 4d. Image scale: 0.125 meters / pixel. The lower unit lava floor looks a lot like sand dunes and is indicative of gaseous venting. Do you see what could possibly be some very small vents? Also note the scalloped edges of the upper unit mound. A nice example of the elephant skin texture seen near the edges of Ina's mounds. 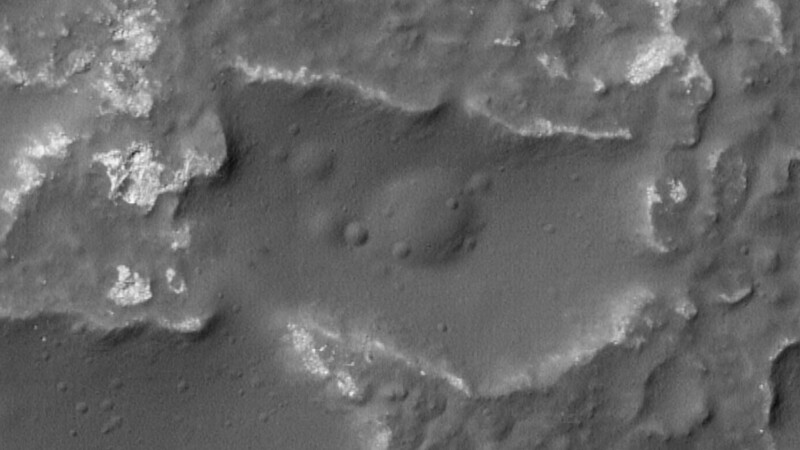 The adjacent lower unit in this particular region does show a few actual meteor craters, but certainly at a much lower cratering rate than is seen on the large upper unit mound. Figure 4e. Image scale: 0.125 meters / pixel. Figure 4f. Image scale: 0.125 meters / pixel. Note the remarkably fresh blocky breakouts and the tiny pits in the floor lava flows. 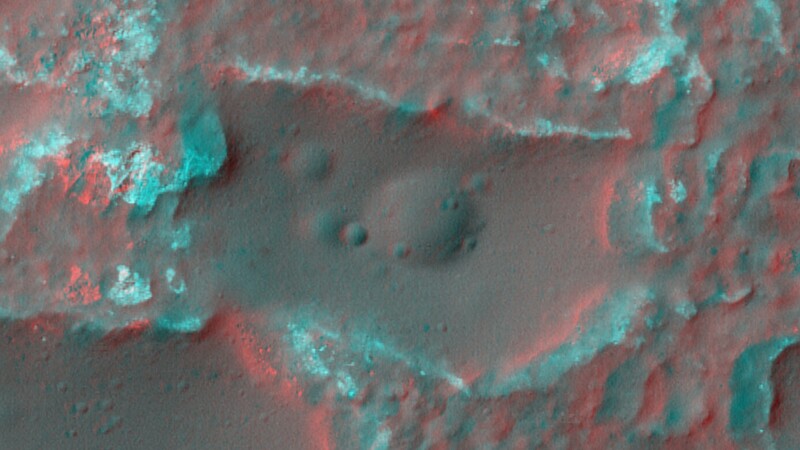 Tiny boulders are frequently seen in the centers of these tiny pits. 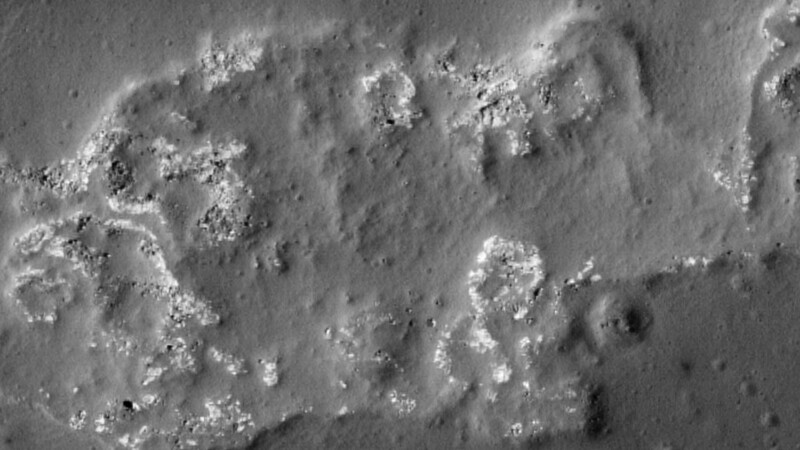 Were these tiny boulders ejected from nearby such that they landed on a semi-molten lava floor, creating these tiny pits with very steep walls? As this example shows, the upper unit mounds generally feature sharply defined moats along their edges. This suggests that the molten lava of the lower unit areas cooled, contracted, and pulled away from the edges of the mounds to create these moats. 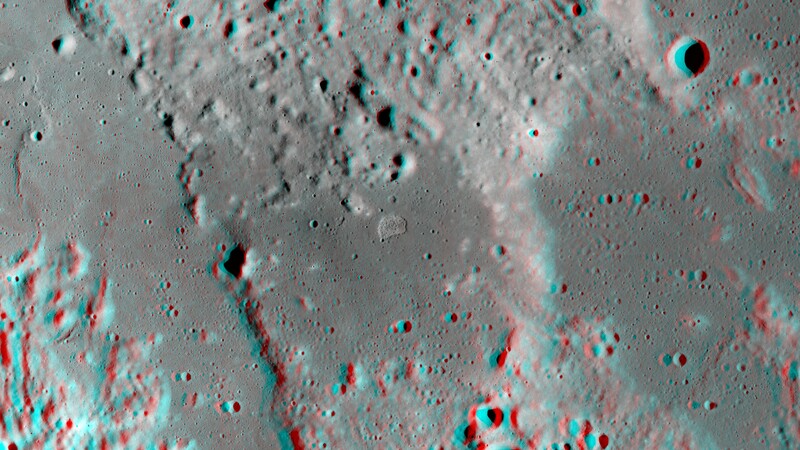 Additional 3D Close-Ups from LRO Low Periapse Orbital Stereo Pair Images M175239283LCRC and M175246029LCRC. Note: I have yet to create HTML files which overlay the image scale on top of the following images and which show the following images at their true 0.125 meters / pixel image scale. Partially melted upper unit and lower unit with blocky material. Image scale: 0.125 meters / pixel. A lower unit with a very foamy texture. Image scale: 0.125 meters / pixel. 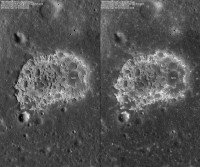 The left and right images show a strong difference in albedo for what appears to be the partially melted remains of the upper unit which lies on top of the lower unit. You will note that the albedo for the surrounding unmelted upper unit areas (upper left and extreme top, and lower right) show similar albedo. This foamy lower unit exhibits striking differences in albedo in the left and right stereo image pairs in comparison to the albedo of the upper unit which is seen along the left sides of the these images. The moat where the lower unit meets the upper unit is clearly visible. 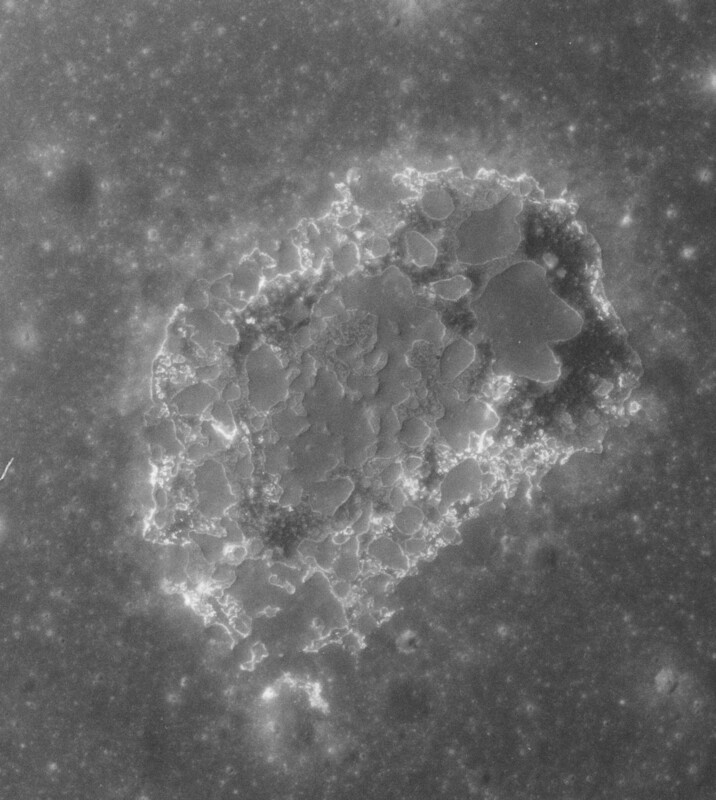 Are what appear to be craters on the lower unit really craters which were created by small meteorite impacts, or are they the result of gaseous venting? A lower unit which is peppered with very tiny boulders. Image scale: 0.125 meters / pixel. Partially melted upper unit which is surrounded by a foamy lower unit. Image scale: 0.125 meters / pixel. Don't do any crater counting here! 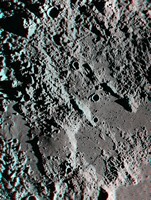 The majority of the lower unit's tiny craters have a tiny boulder within them. 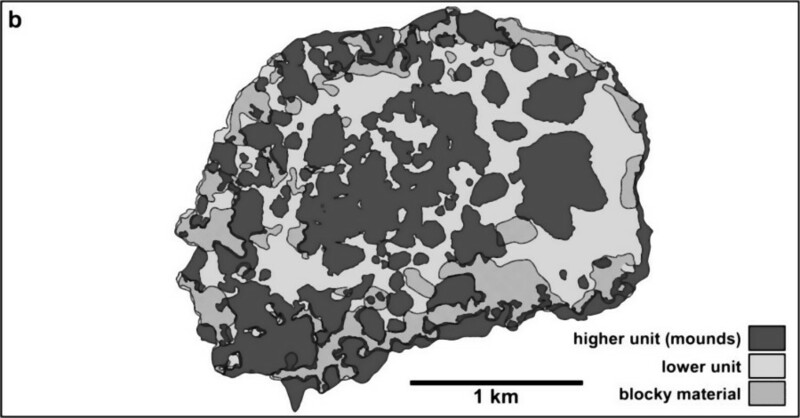 Were these boulders lifted to the surface by the upwelling magma foam, or were they ejected such that they subsequently landed on top of the magma foam? If the latter was the case, then the upper unit should be covered with significantly more tiny boulders. Do you notice the distinct lack of cratering on the lower unit shown below in comparison to the partially melted upper unit? This particular lower unit shown below, in comparison to the lower unit shown directly above, appears to show somewhat more cratering. This suggests that the lower unit shown above was more recently created in comparison to the lower unit shown below. 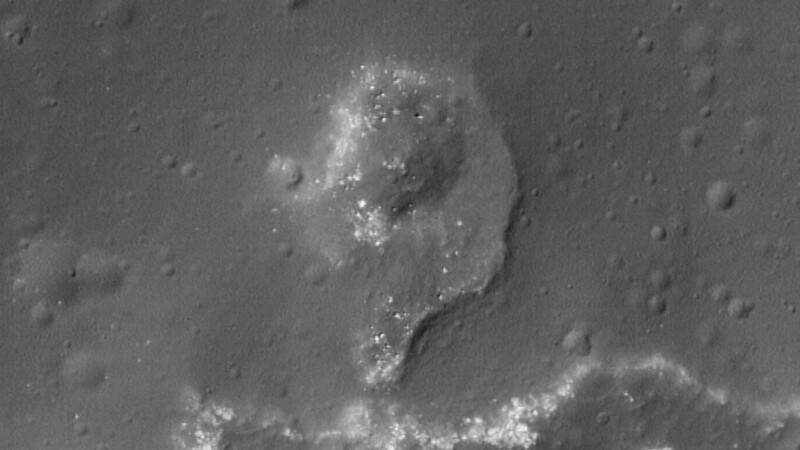 Both lower units are at significantly different locations on the caldera floor. Melt through of an upper unit by magma upwelling. Image scale: 0.125 meters / pixel. The Fallen Astronaut and the Eagle. Image scale: 0.125 meters / pixel. Quite clearly, this lower unit appears to consist of magma foam. Obvious vents are seen in the foamy lower unit which melted through the overlying upper unit. 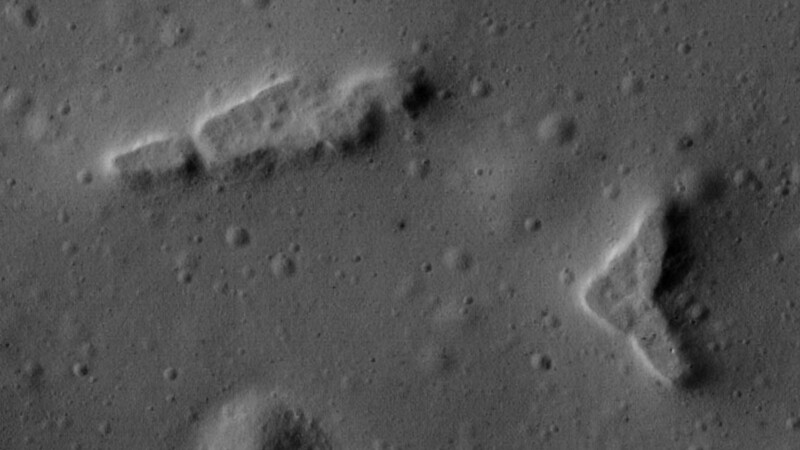 Moreover, what might be interpreted to be craters on the lower unit actually appear to be gaseous vents on the lower unit since the slopes and profiles do not match what one would expect to see for craters. Yes, I am coining these names for these two Ina features. Both of these lower units are melt-throughs of the upper unit, and both lower units have no meteorite cratering since the slopes of all apparent craters are inverted in comparison to normal meteorite craters. 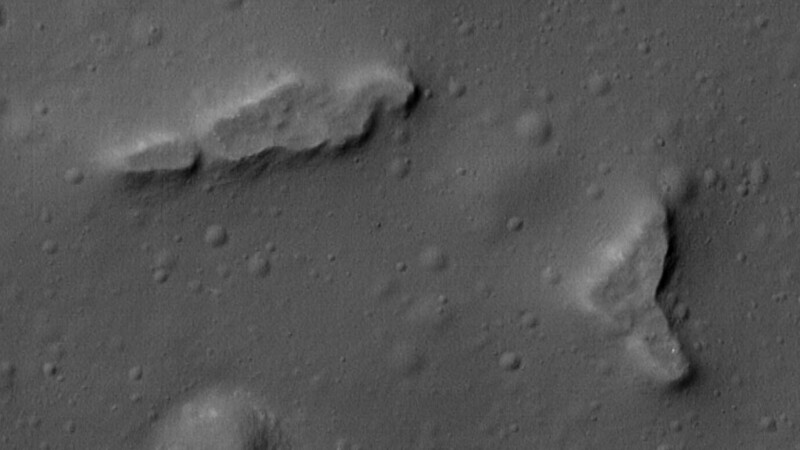 In other words, all apparent craters in these two lower units are vents. Image scale: 0.125 meters / pixel. Image scale: 0.125 meters / pixel. Melt through along the north edge of the caldera. Image scale: 0.125 meters / pixel. Lower unit volcanic vents. 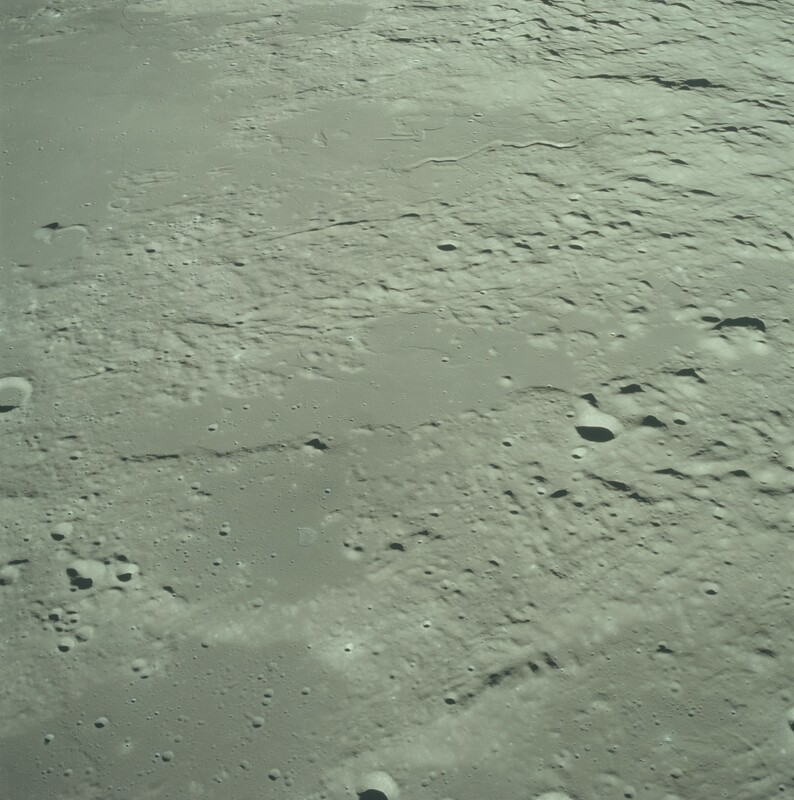 Image scale: 0.125 meters / pixel. This particular lower unit appears to be older since its moat edges are somewhat eroded, and since this lower unit doesn't exhibit nearly as strong differences in albedo in comparison to the other lower units which are shown above. Several (I count six) volcanic vents are seen along with a combination of magma foam upwelling (left of vents) and partial upper unit melt (right of vents). After examining the details shown within the above images of Ina, it is apparent that many features within the Ina caldera are very sharply defined. This fact alone indicates that these features were created relatively recently. If these features were fairly old then micrometeorite bombardment would not only have significantly smoothed these features on the meter scale long ago such that these features would no longer be sharply defined, but also would have caused these smoothed features to subsequently become pitted with very small primary craters of varying size. 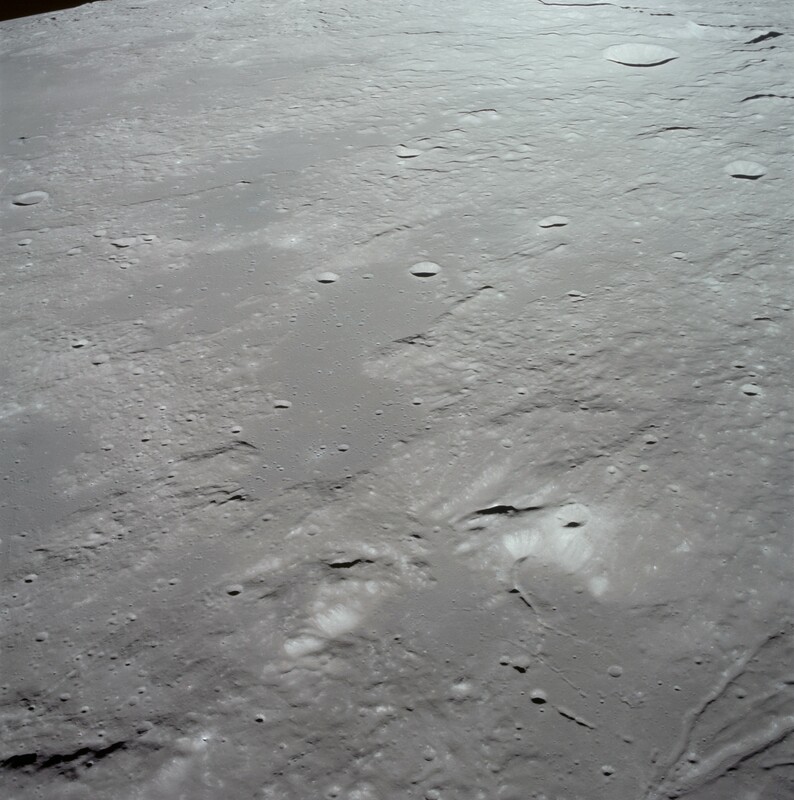 It is also obvious that the lack of cratering of the terrain across the caldera floor indicates that this terrain was more recently created than the caldera mounds. This seems to be the only logical conclusion. 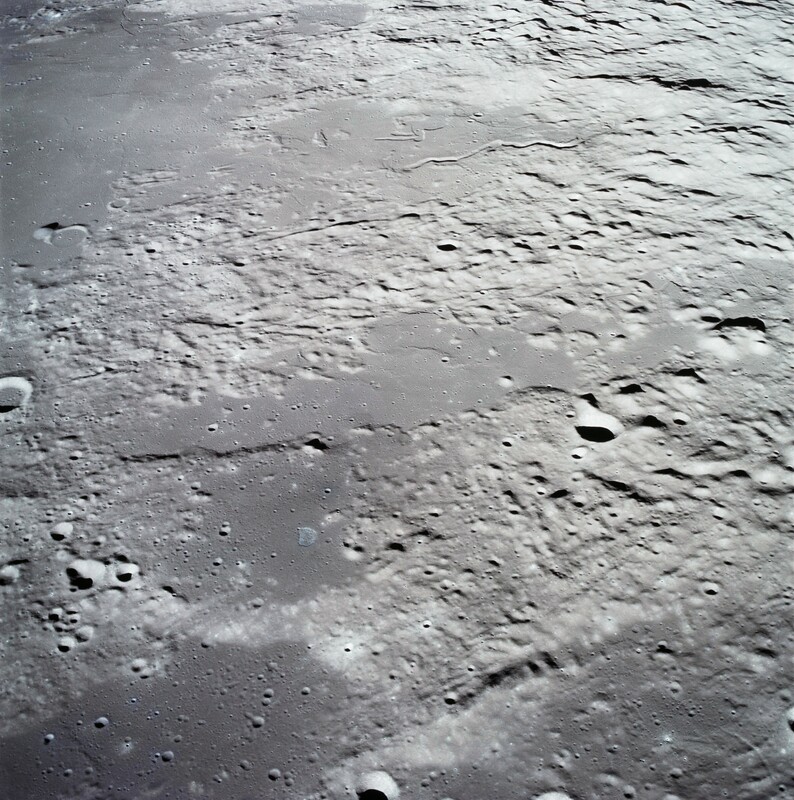 It is also apparent that the different textures and somewhat different cratering rates of portions of the terrain covering the caldera floor indicate that some portions of this terrain more recently created than other portions of same terrain. Three distinct types of terrain floor textures are observed  the blocky units, and lava flows with two distinctly different textures. 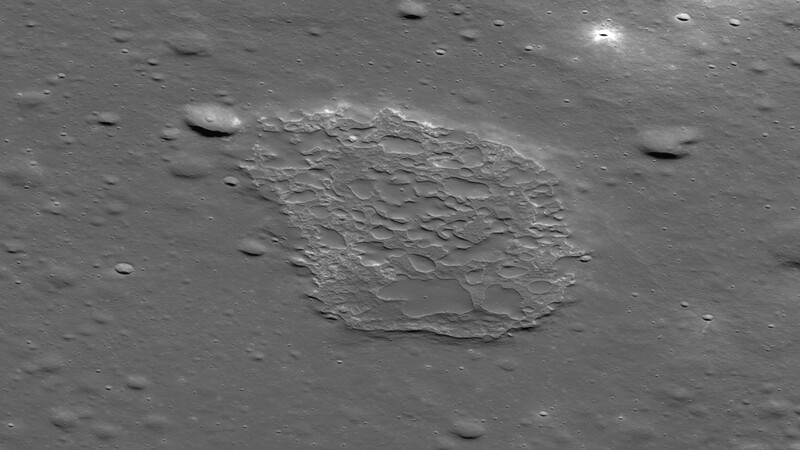 More importantly, what is seen in my 1/2 and 1/4 meter scale deconvolved and enhanced LRO images of Ina do not support any Apollo, Clementine or LRO Era theories which hypothesize that either Ina's mounds are the most recently created features within the Ina caldera, or that the caldera floor features either were created at the same time as the mounds or were created before the mounds were created. I am not entirely convinced that the inflation model is responsible for the formation of Ina's mounds (upper unit) since the cratering rate seen near the edges of the mounds tends to visually taper off relative to the cratering rate seen nearer the centers of the mounds. This is especially apparent on the larger mounds. If each mound was created as a complete unit by a single event of upwelling lava, then one would expect that the cratering rate would be consistent across the entire mound. I am more convinced that heat and spray from subsequent volcanic events on the lava floor (lower unit) were an erosive force which altered the terrain near the edges of the mounds to create the elephant skin textures which are seen near the edges of several mounds. It is conceivable that heat from a molten lower unit could have partially melted the terrain near the edges of the mounds, not only creating the elephant skin textures but also causing existing smaller craters to simply disappear. This would also explain the moats which are seen around the edges of the mounds since the cooling lower unit lava would pull away from the edges of the mounds, thereby creating the observed moats. Based on the above images, it appears that virtually all of the lower unit (caldera floor) features were more recently created than the upper unit (mounds). I am neither a scientist nor a geologist. I would like to get answers for the following questions. Can upwelling lava adjacent to the mounds create the steep slopes, the elephant skin texture, and the sharp edges which we see along the edges of the mounds by melting the edges of the mounds or by completely dissolving portions of the preexisting mounds? Can heat from a molten lower unit lava floor cause erosion along the edges of the higher unit mounds, similar to how ocean water erodes coastal beaches on Earth? A comparison of LRO images of the edges of the mounds bears an uncanny resemblance to terrestrial aerial views of beaches along the coast of Great Britain in which the eroding force is the ocean instead of what appears to be partial melting of the higher unit mounds caused by an eroding force of heat from lower unit lava pools across the caldera floor. Can upwelling lava undermine the edges of the mounds and cause the mounds to slope downward and to develop an elephant skin texture? Are the mounds merely what is left of much older regolith, which at one time completely covered the caldera as a result of much older magma eruptions, yet which was subsequently been dissolved by subsequent magma eruptions? Was the original Ina caldera much larger in the past? NOTE: The following list has not been updated in quite some time. 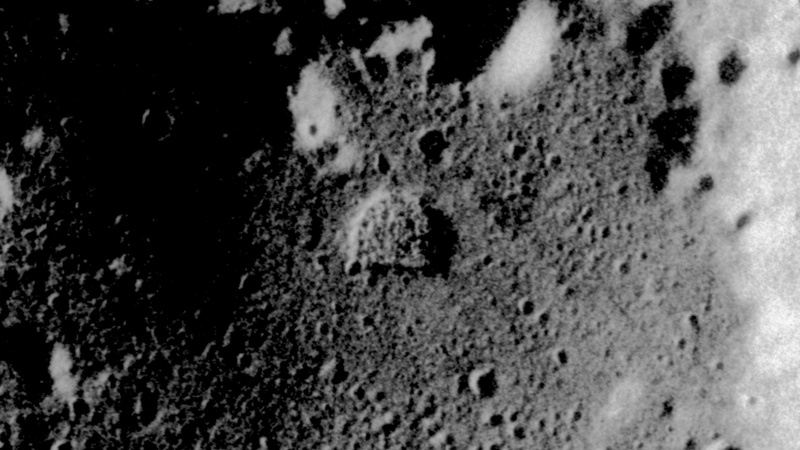 All LROC photos are credit NASA/GSFC/Arizona State University. Note that the image pairs may be either mirrored, flipped or rotated 180 degrees, depending on the orientation of the LRO when the LRO took these images of Ina. Much more is to follow! Please check back for updates to this web page about Ina.